Tomorrow is a much anticipated day. First day of December. I can tell you that the last 1st of December back in 2008 saw the market drop huge in a big sell off. 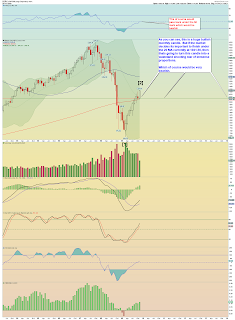 But admittedly the price action of the past day and a half has been the markets absorbing all the selling, while maintaining above major support, and then eventually making headway back up again as it did in the afternoon. And then as you can see on the Wilshire chart, it was stopped perhaps temporarily exactly at the head and shoulder neckline. I would be more bearish if the market had made a beeline straight up today, but it rather put in a very workmanlike day that we have seen too often during minor and major turning points during this P2 in which it works off the selling, maintains the pivot, and makes forward progress eventually. If the market did selloff after having this familiar behavior pattern play out would help identify a trend change as it would be unexpected from what we have seen over the past 8 months. 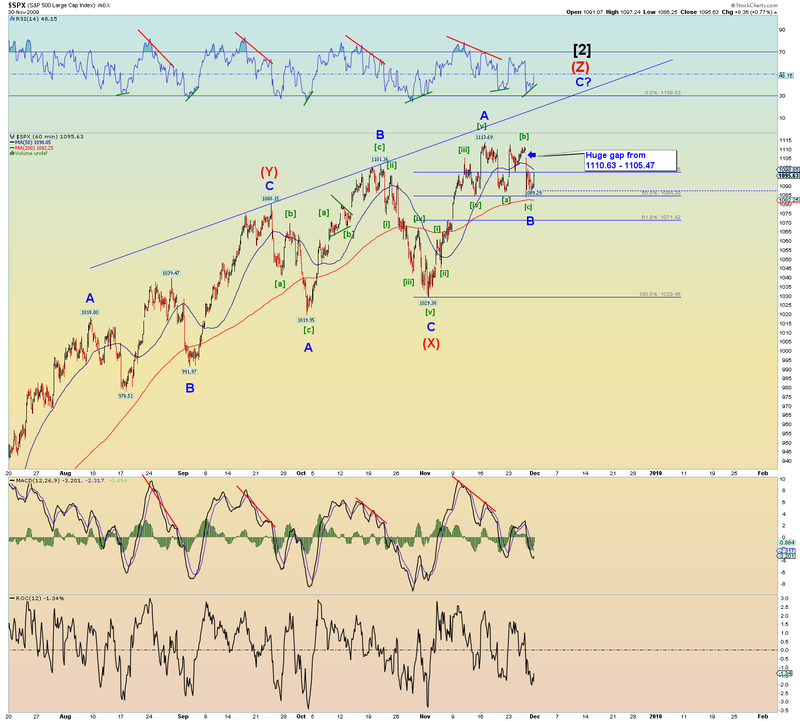 So the bulls are trying to put itself in position to challenge 1100 again. 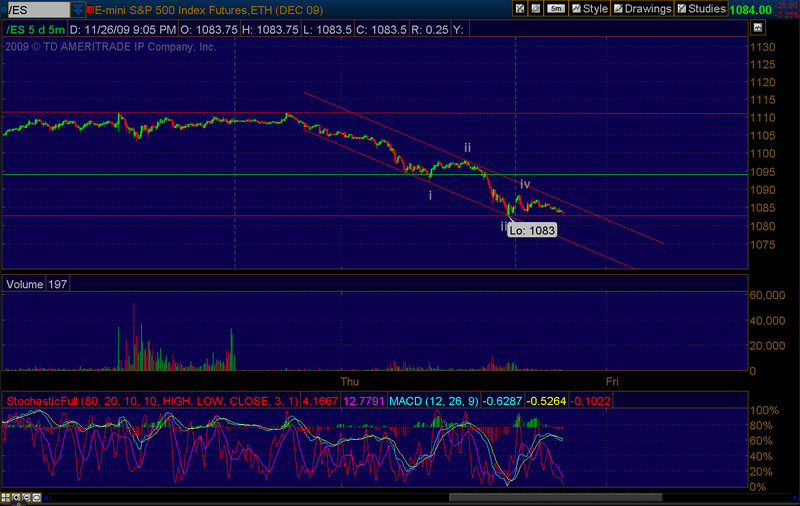 And if it can gain 1100, it should be able to challenge its big gap down hole from 1110 - 1105 or so. And then we would see how it handles the gap. What I don't like about the bearish side is that there is a feeling of concern and mild "panic" (VIX did jump 20% after all) with the Dubai situation, yet prices maintained rather very well. 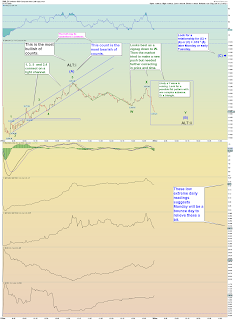 So if sentiment went too bearish too quickly, its actually bullish. Thats the "wall of worry", at least for now. This is one night I really look forward to EWI's update as I don't have a good answer except that I expect (and hope) that the big gap down from 1110-1105 gets filled/challenged. At least thats what prices seemed to be signalling today was their intention. 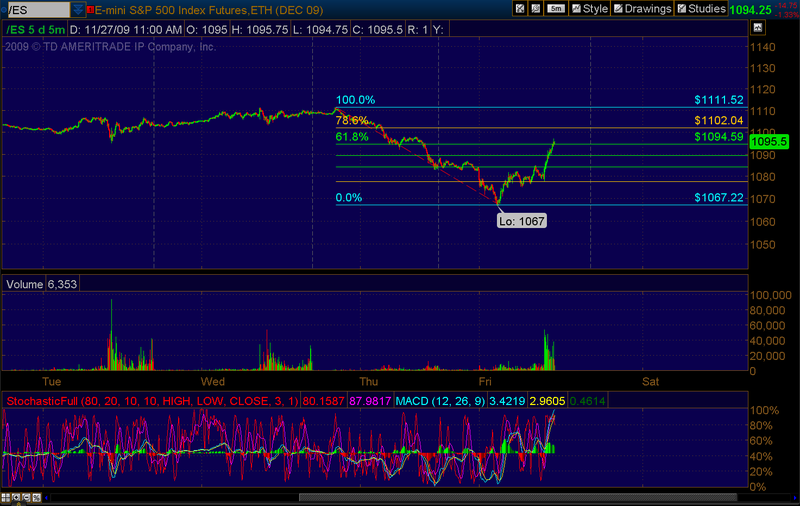 And of course if it conquers the gap, its only a point or so away from making a new high anyways huh? Two areas of resistance are marked roughly by the horizontal lines. 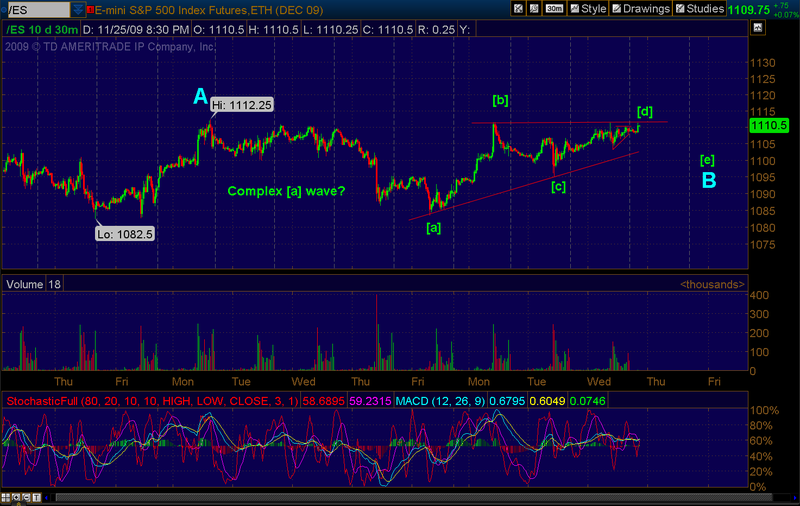 The e-minis did not make a 5 wave move up yet from bottom. It came within .25 points of matching its Friday high. And no I do not consider it a truncation. 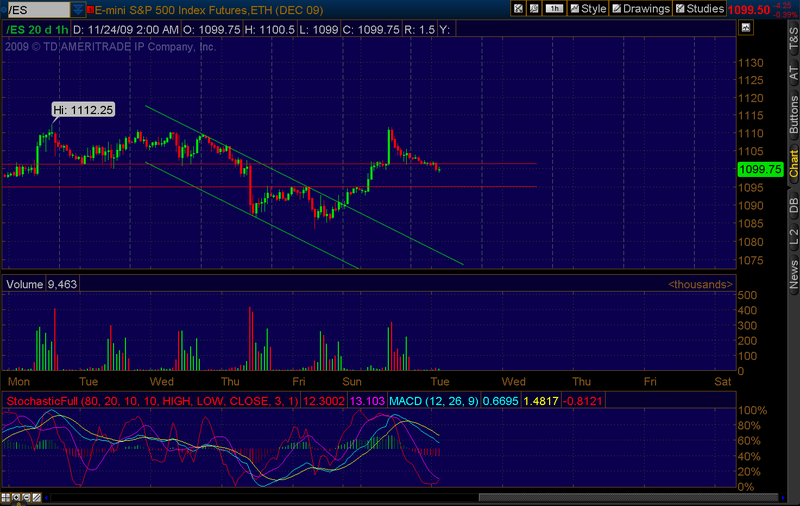 The stochs and MACD on the hourly had a sell cross last night. 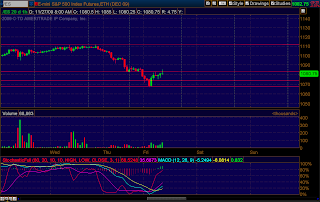 The market internals were very bearish on Friday with the advance/decline volume ratio ending about .04. Its remarkable though that even though Europe was down some 5% from from its late Wednesday highs to its early Friday lows, the DOW lost much less and closed the day only 1.5% off the mark. 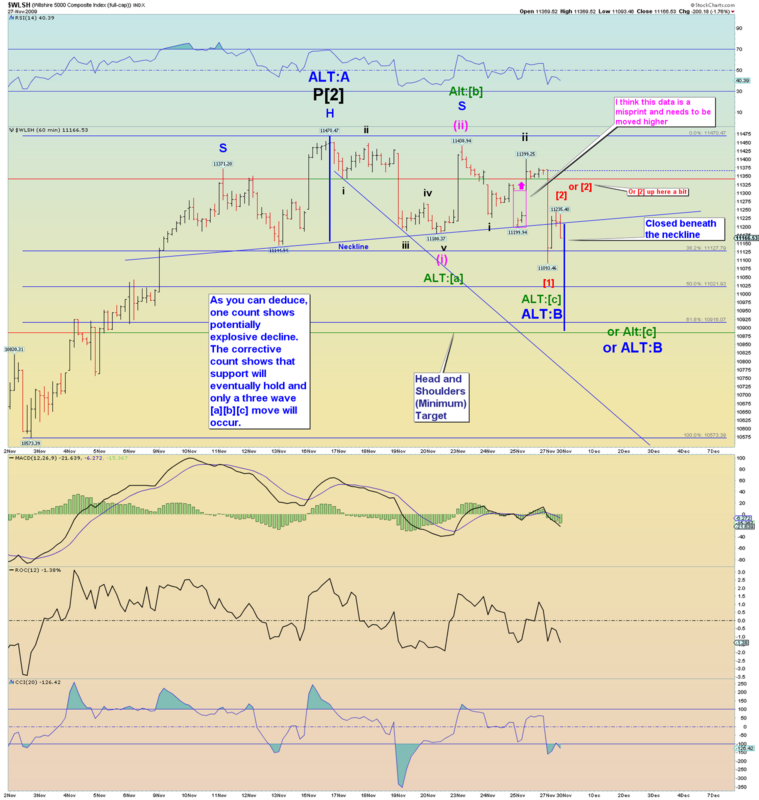 The SPX produced over a 5 point gap down and in fact the first 2 minutes saw some 23 points whacked off the index. 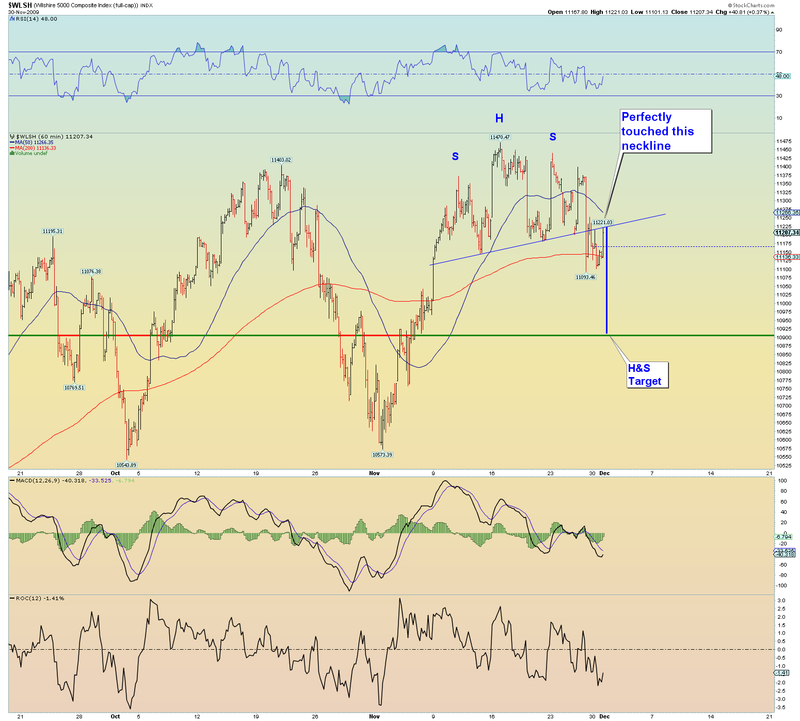 But it bottomed at support within minutes and sharply climbed the first half of the day. Yet the market internals were so squashed that even by end of day they had very low readings. And that would suggest Monday was going to be an up (or the very least not a big down) day to help relieve those superbearish readings. The squiggles supports that view. 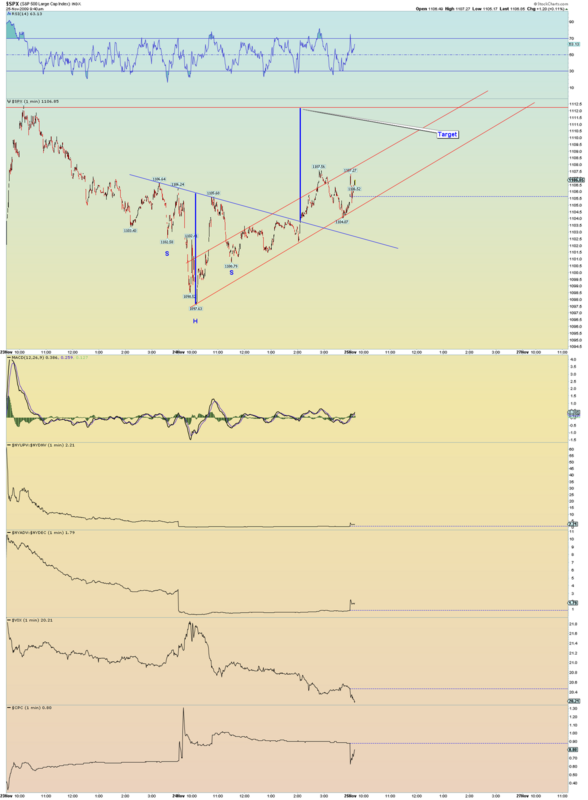 And the big untraded gap area is a bull target. 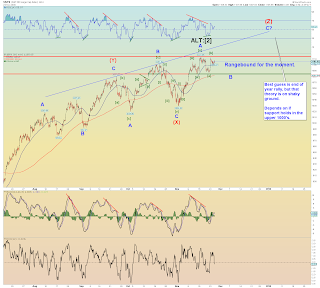 On Friday's update I gave the count on the chart as a very bearish series of 1,2's playing out. This super-bearish count could still be the case even if Monday shakes out in a rally upward in one last ditch attempt to keep it all floating. 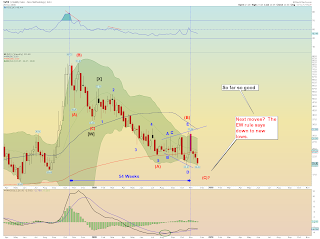 The superbearish count probably cannot occur from such low market internal readings just yet. 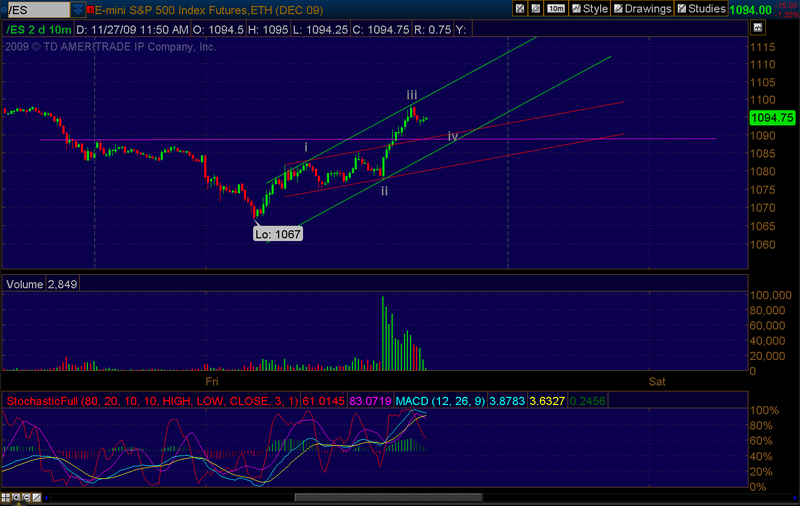 So another day of consolidating may be in play prior to the real King King move of a third wave down. And it may want to challenge the big gap down area first. The chart below supposes that the bulls have not yet had enough of P2. This count is the triple zigzag from the March low and Friday was either the B wave low I have been talking about or it will occur sometime this week a bit lower. What count do you prefer? 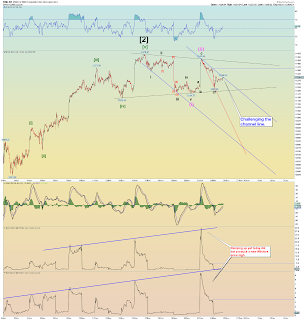 Super bearish (P2 topped) or bullish (Friday was a B wave low) or somewhere in between (more downward correcting to come in time and then a move to new highs later down the road)? Its a strange market at the moment. I watched BIDU trade at $425 in premarket Friday (I had covered in premarket) and rally out the gate to finish almost back even at $441 near where it left off from Wednesday even though market internals were bloody at the end of day. 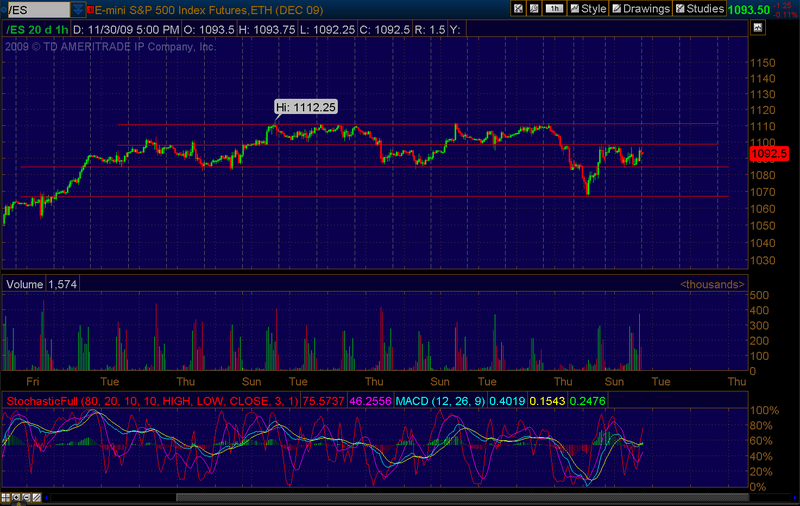 The qqqq's bounced pretty good on Friday. 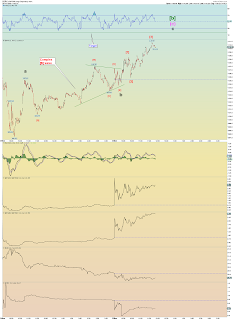 Amazon is still above $131 and the SPX closed above 1090. So all-in-all, the price action is bearish (wild price swings in indexes at a rally high) yet the actual prices themselves have managed to maintain very well indeed. 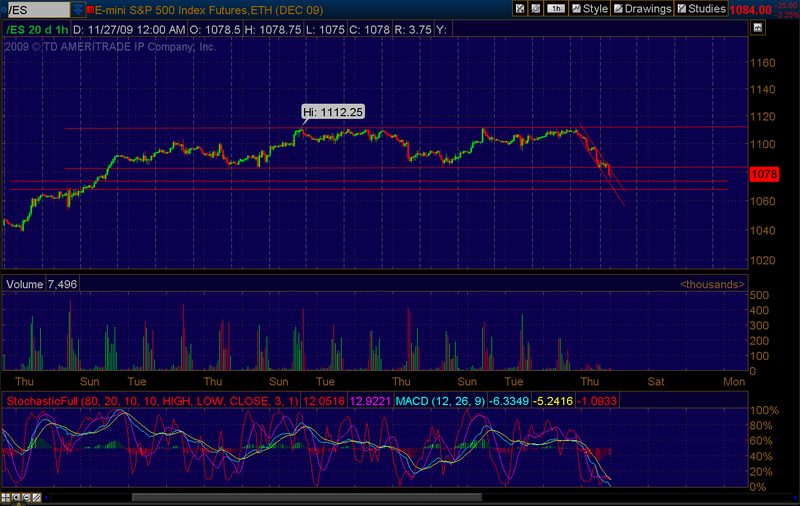 The DOW got "hammered" out of the gate yet its still at 10,310! Two markedly bearish downturns within last 6 days yet they produced no horrible prices just yet. 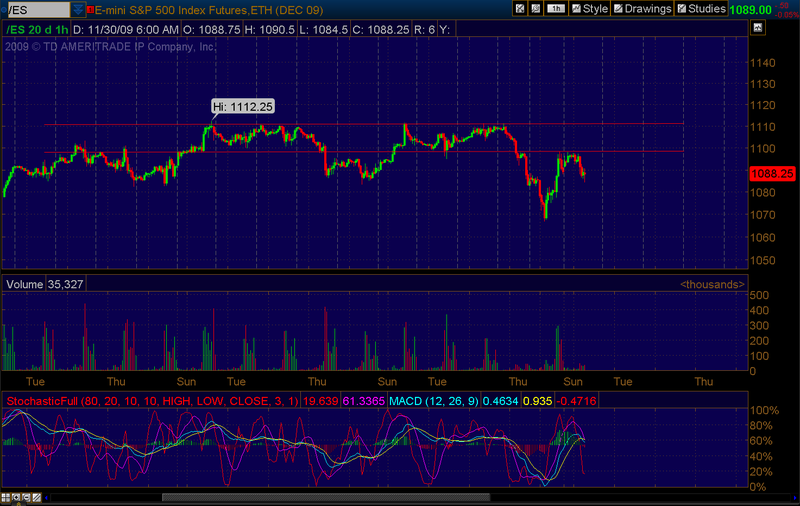 Still solidly in the "trading range" rotating around the 1100 mark. I am willing to give up the Minor B wave of a triple zigzag count but I haven't had a need to give it up fully yet because it has yet to be disproved. 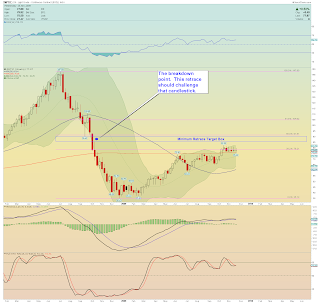 Also its just more risk in my opinion to be on the long side at this stage of an 8 month mega-rally. 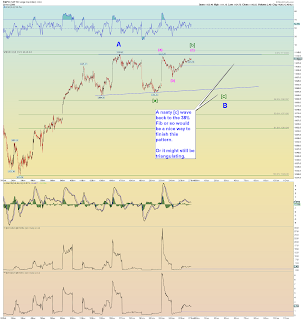 A while back I took a look at the Nikkei's count and how it relates to the DOW. 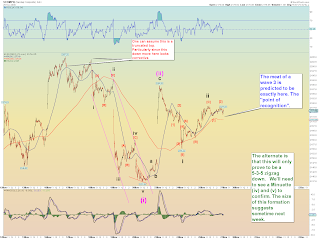 The chart below is an updated chart taken from the approach that the Nikkei has just about finished its "third of a third" wave down. 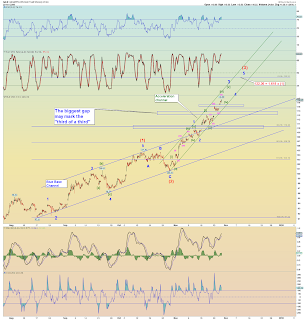 I suspect this because its RSI is oversold and heading to its extreme. 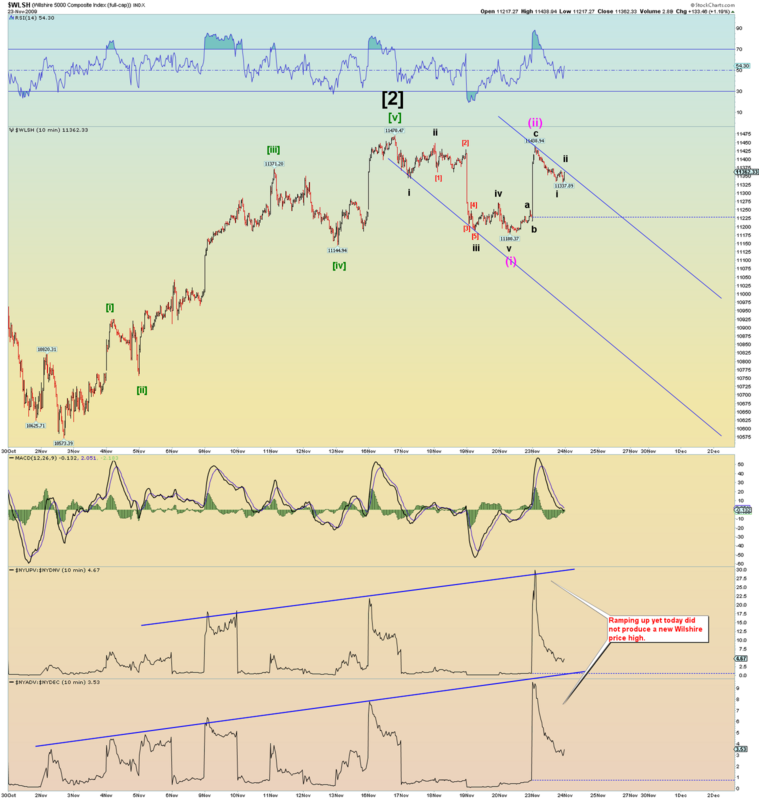 I have found that RSI lows typically occur at the price low of a subwave [iii] of wave 3. 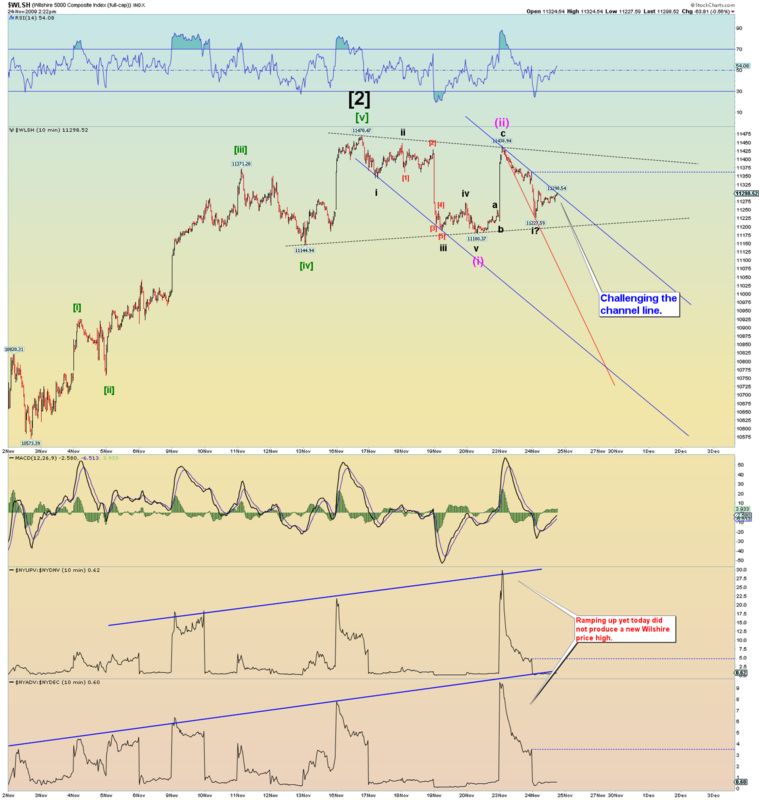 In this manner it begins to start to form a double positive divergence. 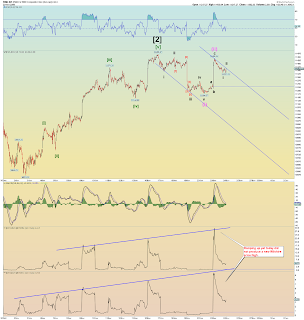 The first divergence occurs on wave 3 low and the second on wave 5 low. 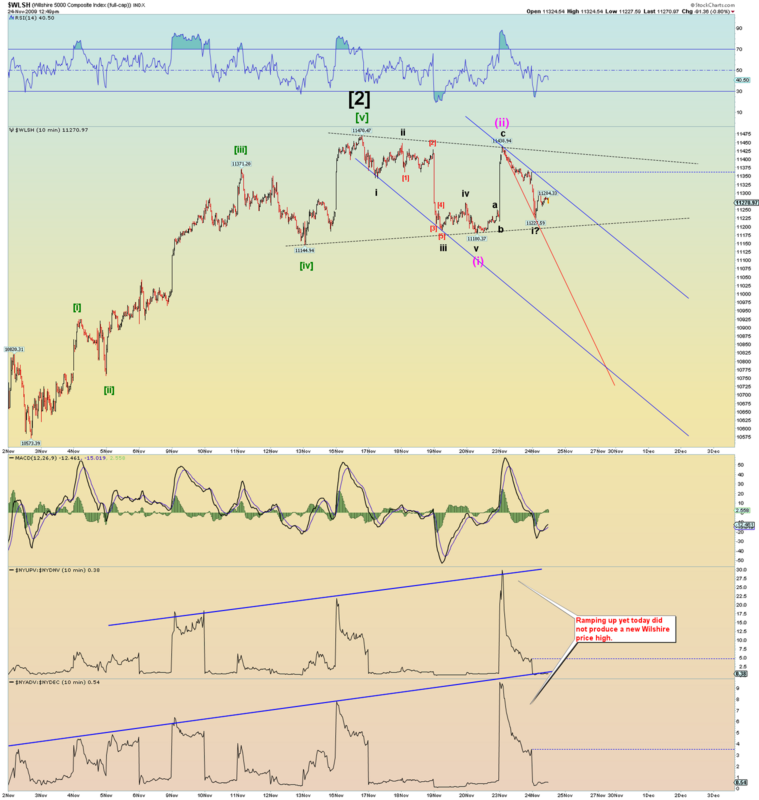 This double divergence signals a wave (2) rally is coming. The next chart below supposes that the Nikkei is actually tracing a leading expanding diagonal for its Wave (1) down and that it is nearly finished and will rally on a wave (2) shortly. Instead of approaching the recent gap down as a "third of a third" in the chart above, I approached it as an exhaustion-type gap. 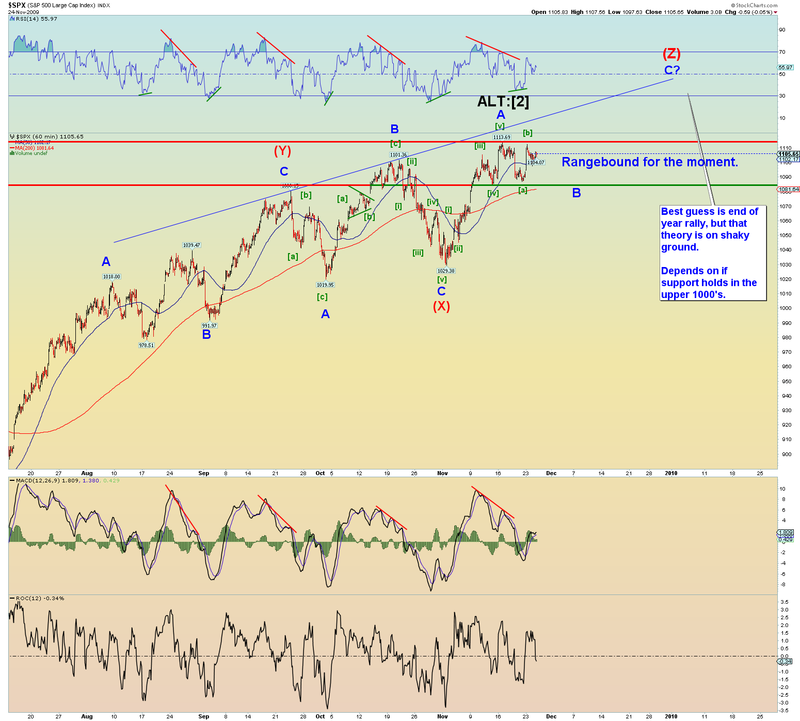 The big concern in this pattern is that wave 2 appears to be a flat where it should be a zigzag. 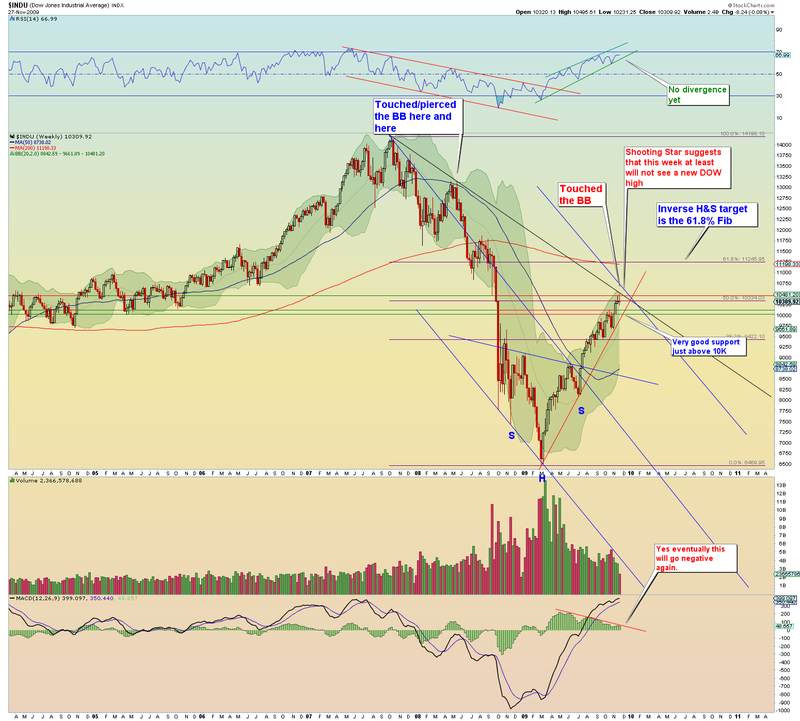 The other aspect is that there is no RSI divergence on this chart to speak of. Also money flow (not shown) seems pretty good still. 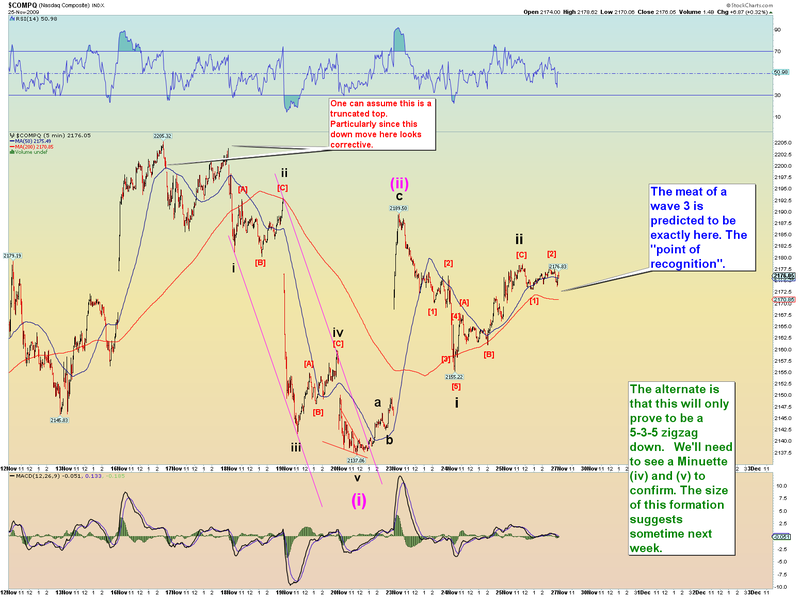 So taken altogether, one could make a case, even if the DOW corrects further (likely) the Nikkei - DOW relationship and the strength of the DOW suggests it may, weeks down the road, rally to yet another recovery high at the point the Nikkei rallies in its wave (2). 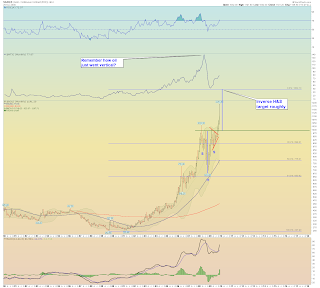 That would be like the 2007 rally in which it reversed a summer correction that appeared to be the beginning of P1. 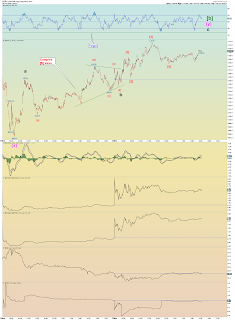 Of course this doesn't have to be either but the whole relationship is interesting and the fact that the Nikkei is bottoming in its daily RSI and the DOW is coming of a big peak is something that cannot be ignored. The big difference at this point of time versus 2000/2003 and probably even in 2007 is that the currencies of each nation appear to be playing a much bigger role in things in both the DOW and Nikkei. The chart above pretty much shows the options. Don't get cynical LOL. Yes I got it all covered but thats what EW's is all about. There could be further bounce on Monday upwards and then it could eventually run into resistance it cannot handle and reverse down in a big way. Or big money could come back in first thing and dump. Or the e-minis could be dumped Sunday night or runup depending on how Europe is feeling. I have no clear option for the squiggles just yet and the e-minis will have to give us a clue on Sunday night as they themselves only rallied in 3 waves so far. 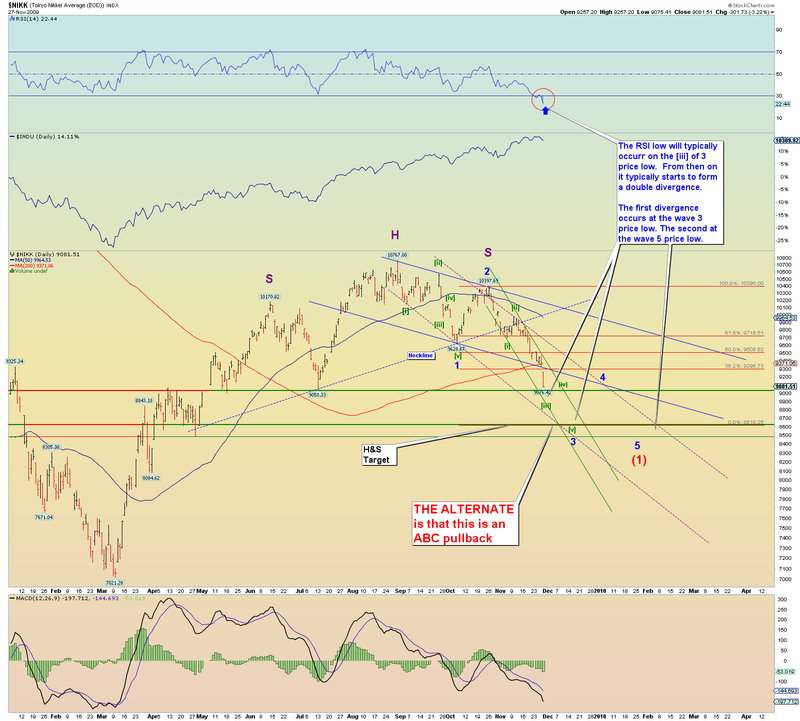 So a series of 1's and 2's counts best for the bearish count which means we have yet to see all hell break loose. 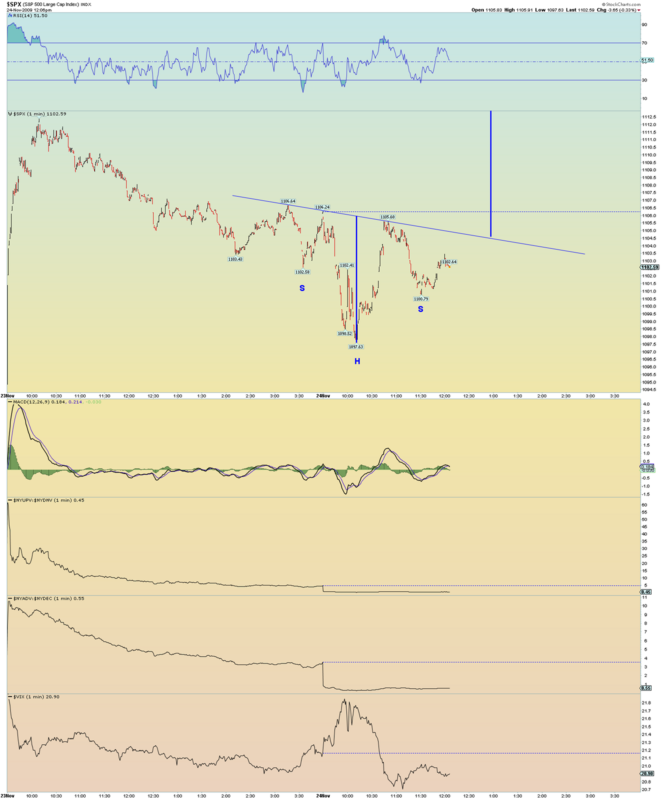 The technicals all point bearish and lots of nasty H&S pattern on subindexes also like the RUT. 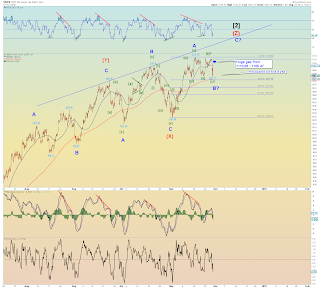 The rally in the e-minis looks more impulsive on the way up than on the way down. 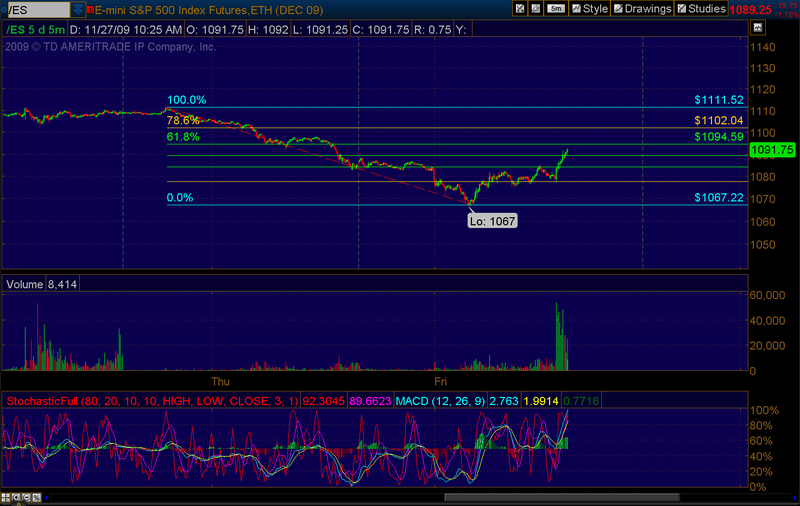 And its working on the 62% Fib mark already. 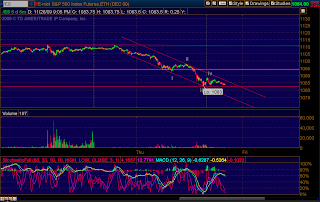 The lower red horizontal line is solid support. Shooting star candle has 7 minutes left to not be. Nasty and Europe hasn't even opened yet. Broke support. 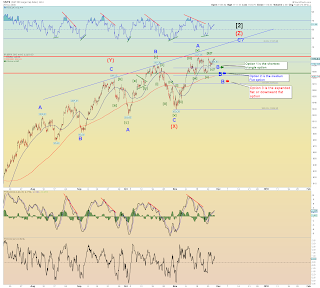 A super bearish NASDAQ count below. 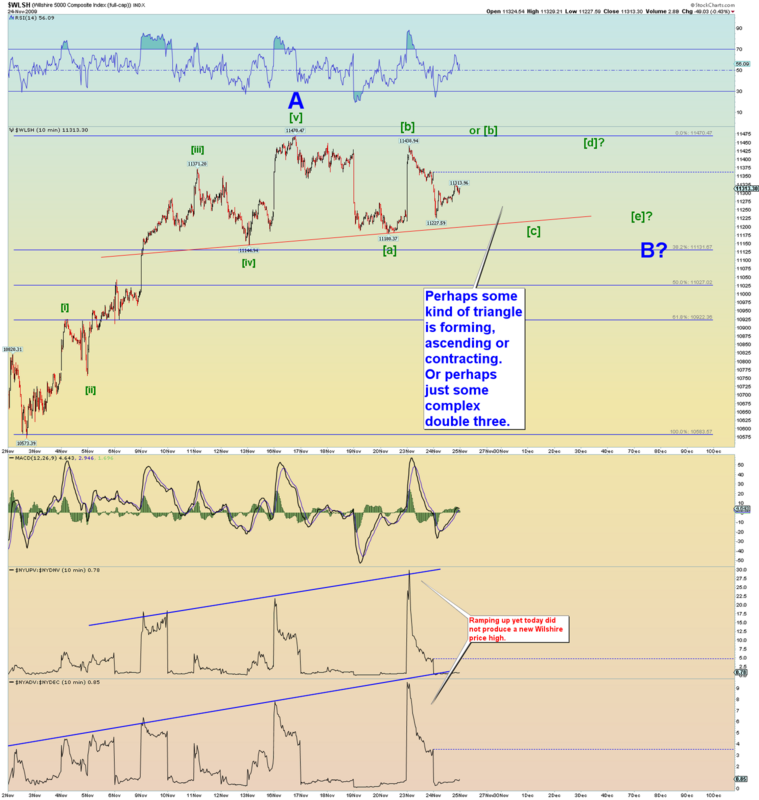 Its of course assuming the P2 peak is in for the NASDAQ. The key of course, once again, is to see if a 5 wave move down at Minuette (pink) occurs to form a proper Minute degree wave [i]. 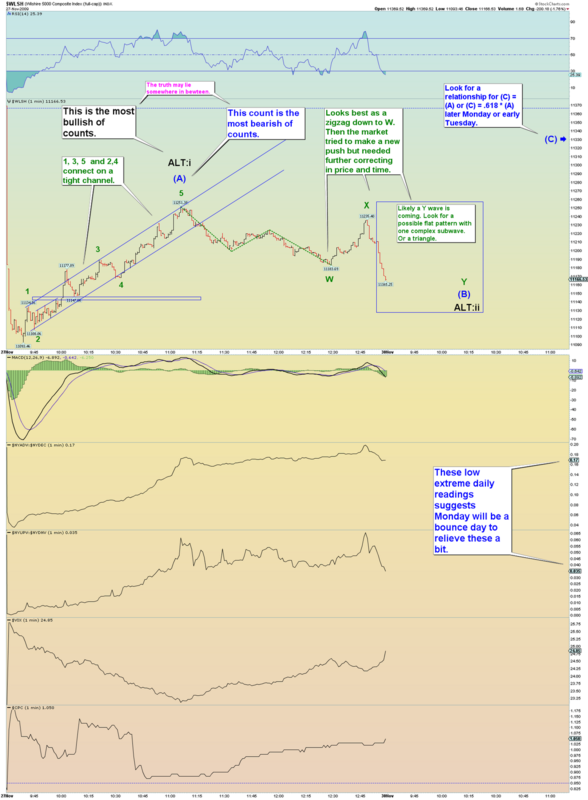 We've been through this drill before and the last time it happened, the markets had what appeared to be a 5 wave move except it was, well, a bit odd in many ways. 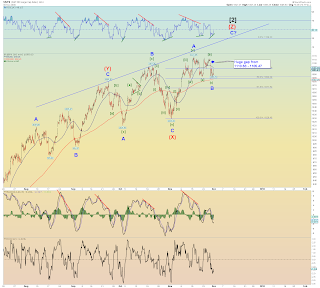 And of course it proved not to be Minute [i] because the 3 major indexes went on to rally to new highs. I've also taken the liberty to assume this NASDAQ orthodox peak was truncated. As an aside, the E-minis went on to make a squeaker new low and it may mark the e-mini low for now because its counts pretty decent as a 5 wave move down. 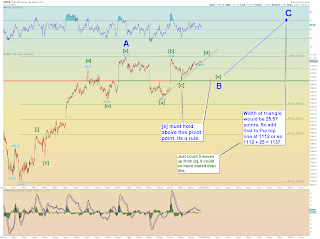 Seems to be working on a 5th wave down. 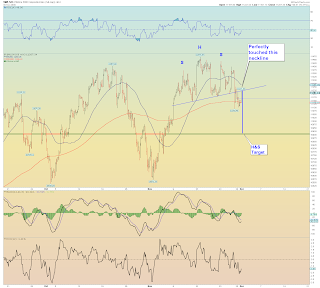 The green resistance line will be very tough for the e-minis to get back above near term in any bounce. We have the advantage of seeing how Europe will react a second day after closing on lows and down over 3%. As many commenters have pointed out, the eminis makes a nice "triple top" formation. [Update 12:16pm] - The sentiment surveys I linked just updated. Bullish extremes are being met. Well I think a triangle option is out. Unless futures recovers somewhat, and they very well might a bit, its gonna be one interesting setup for Friday's market open. 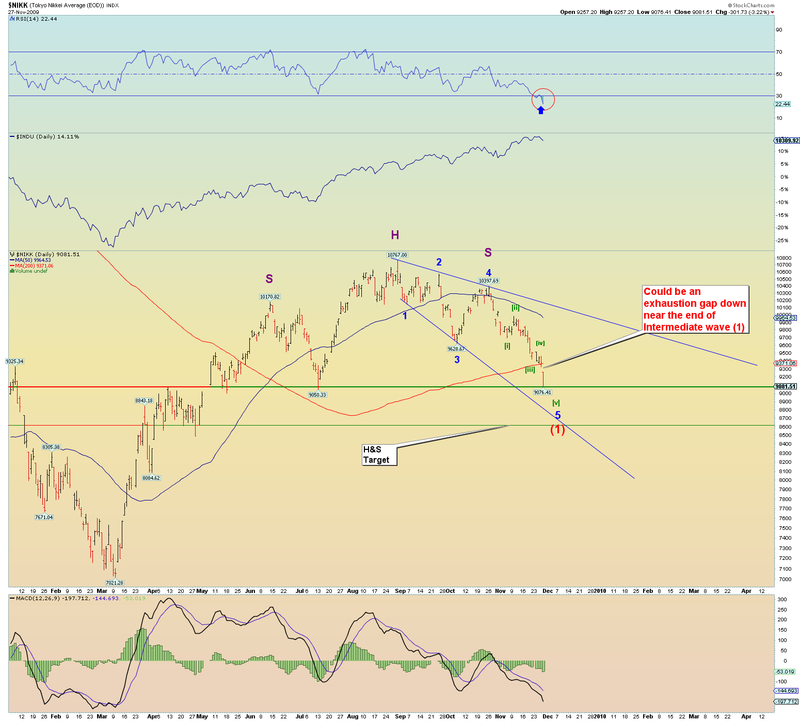 At this moment your looking at a 20+ point gap down on the SPX. 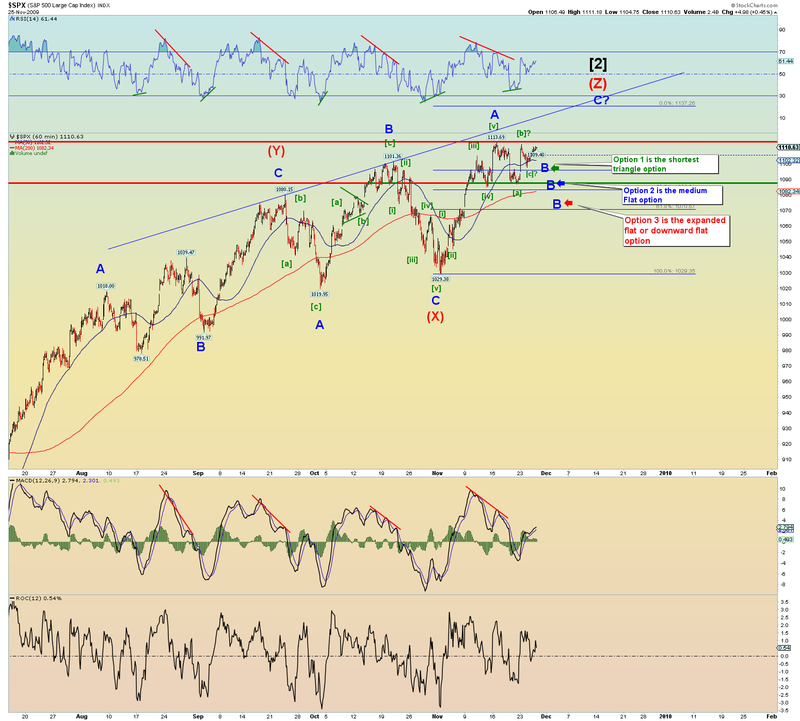 Huge gaps down are big bull targets. If a huge gap down were to remained largely uncovered, it would be a thorn in the side of both bulls and bears and keep 'em guessing all the way down. 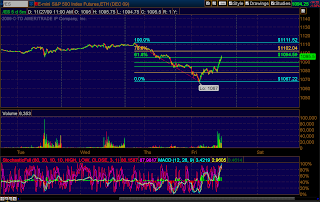 Its going to be an interesting open indeed with a partial market day Friday and lower than normal volumes. As we seen last month the SPX decided on the last day of the month of October to reverse a previous 8-1 up day and turn it into a 90% down the next day and finish the month under the monthly 20 moving average. It was very bear friendly move. A monthly close above this average (which is the midpoint on a standard Bollinger Band setup) is considered very bullish long term by market technicians. 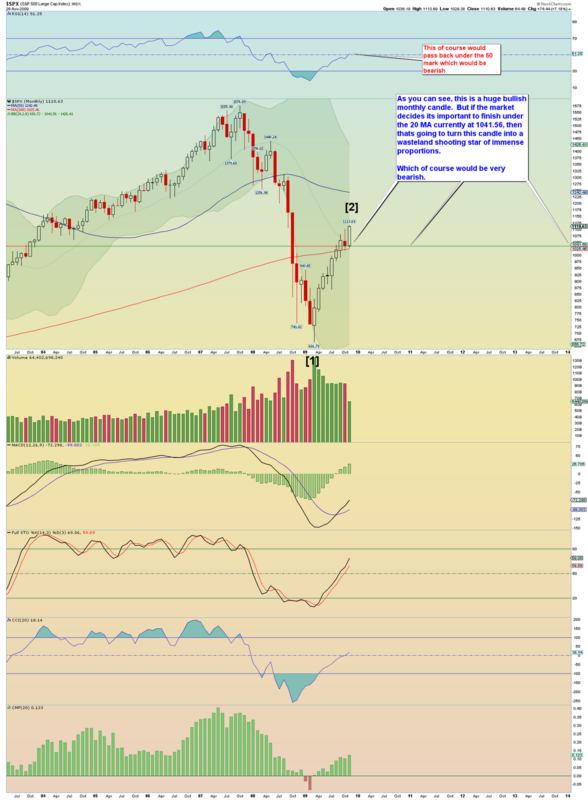 For the SPX to close under the monthly 20 MA it would require a move in a day and a half to under 1041 SPX. That would mean Friday and Monday would be a, well, one hellava nasty down day(s). Thats over 6.5% down from the close on Wednesday. I will say that the VIX, dollar, Gold, oil, banks, etc, etc have all sufficiently produced enough movement to satisfy any EW counts. 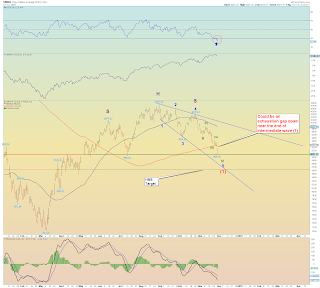 Of course the secondary markets all still show great weakness and divergences such as RUT and others. 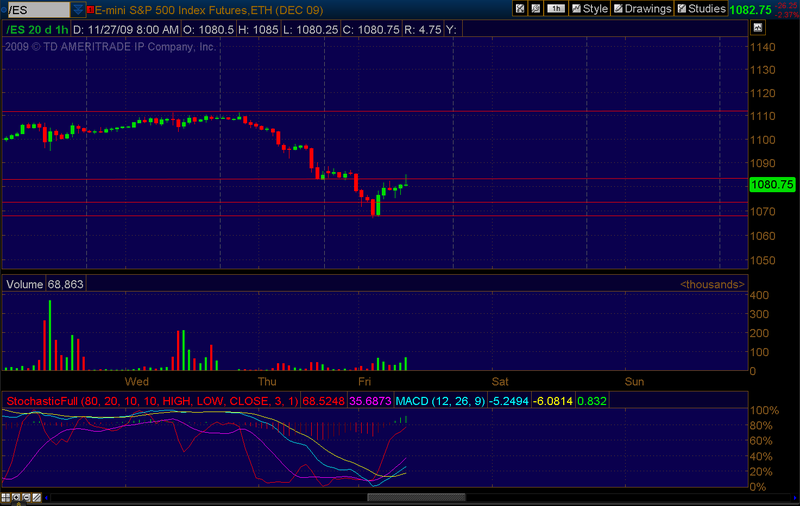 Even the QQQQ's show a lot of negative divergence particularly the weeklies. The "catalyst" for today seems to be Dubai. Everyone has seen those emails that were circulating the last few years of the palm island luxury resorts and the indoor ski slopes. It all seemed so surreal the opulent things they were building. And they did it at the peak of luxury and asset mania. I guess they weren't so smart after all. Even the super rich will be frugal in the bear of all bears. 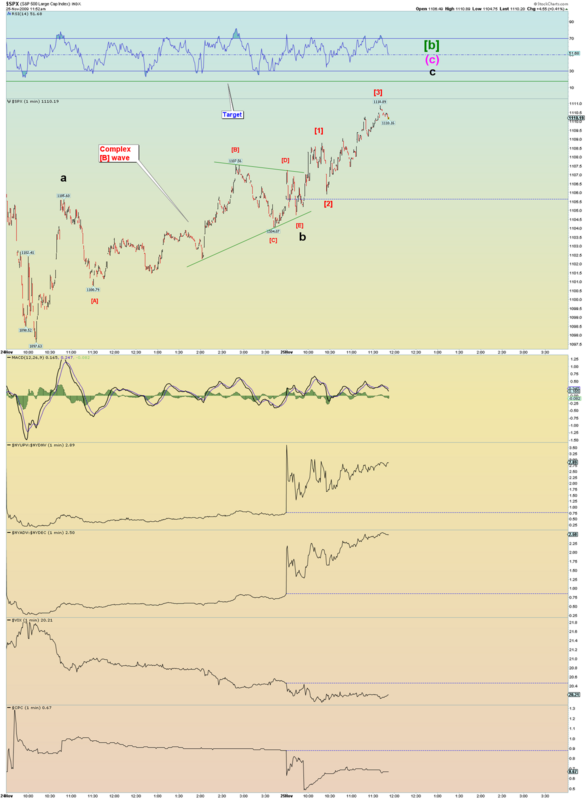 I did expect a pullback in a [c] wave of B of (Z) and was entertaining a low anywhere from 1098 to 1060-1075 area. 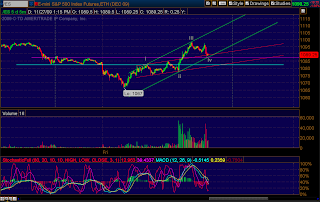 The middle range 1086-1088 would have produced a B wave flat. 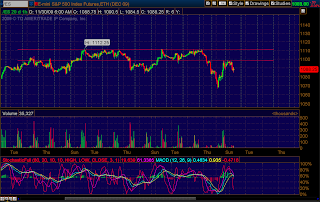 With the severe selling going on in Europe and futures down huge, I question if that area will hold. In fact the pivot on the e-minis is being challenged as I type. 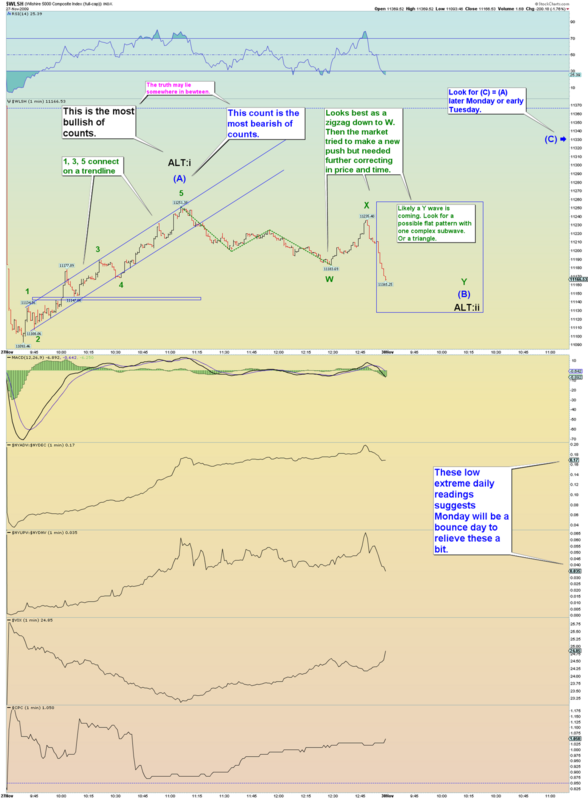 I will also remind that the last time I thought a B wave was playing out in June and that the market would head up, it never happened. So I naturally question my current count. And Prechter said to go 200% short, and that I have to respect. So what am I saying? I am saying I am ready to abandon the thought of a Minor B wave (and hence the triple zigzag count altogether) because I have a particular habit of pushing for that one last push when its not really there. It remains a possibility but after the market spoke today in the overseas venues, its hard to ignore a 3% drop that ended on the lows (Europe). another bad session on Monday and they will close under the monthly 20 MA. 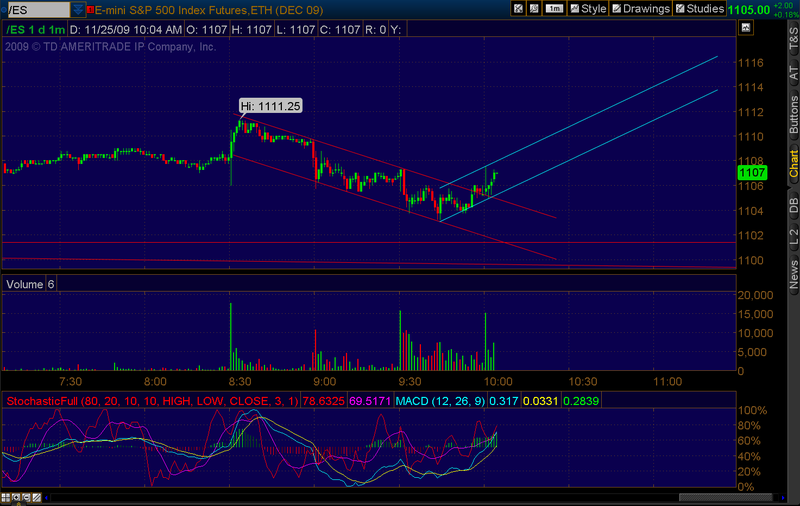 And the thought of a drop to under 1041 by Monday's close is just too "in your face" to pass up. So we'll see. Minute [c] of B down or is it really (iii) of [i] of 1 of (1) of , or P3? Or will we see a nasty selloff to almost 1000 over the next week(s) only to slowly recover in a new squeaker high later in early January? Afterall in the summer of 2007, it appeared all was lost yet it rallied one last time to the October 2007 peak. Base Channel would be wave (1) and (2). The green channel is the acceleration wave (3) channel. 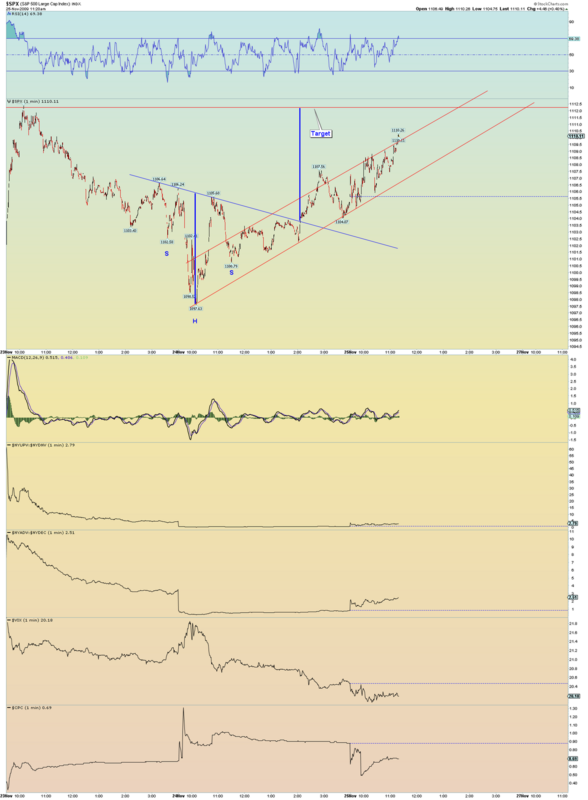 When this channel breaks then it should signal the deceleration channel which would be wave (4). 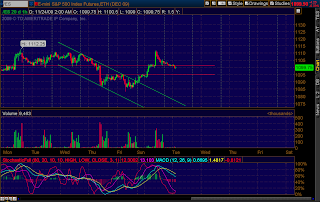 However the deceleration channel may remain tight and not touch the base channel as it is wont to do. 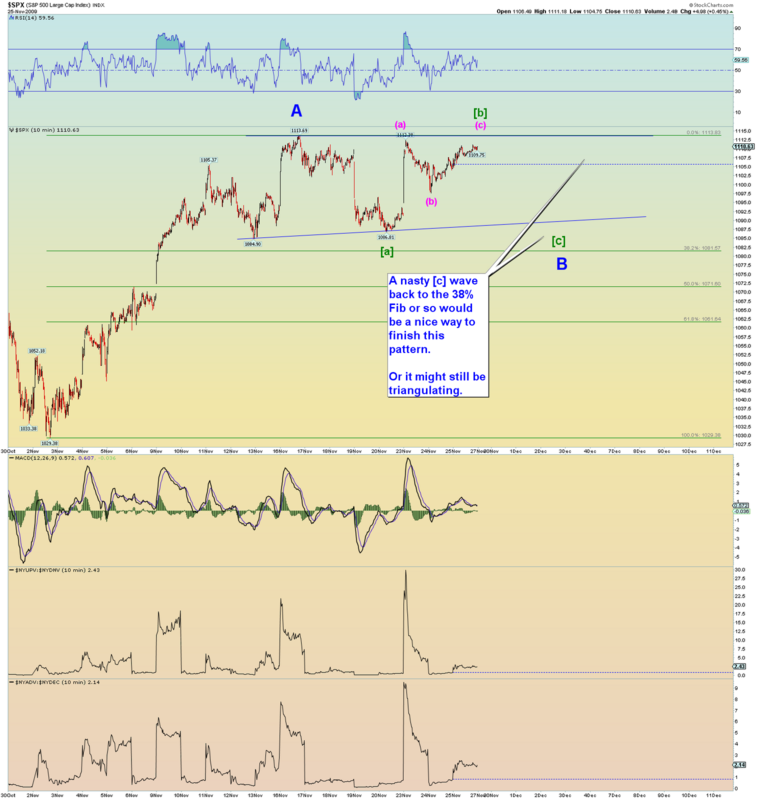 Only look for a retrace to the previous subwave 4 spot wherever that may be. 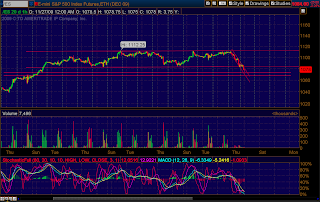 Watch which gaps get filled if any. 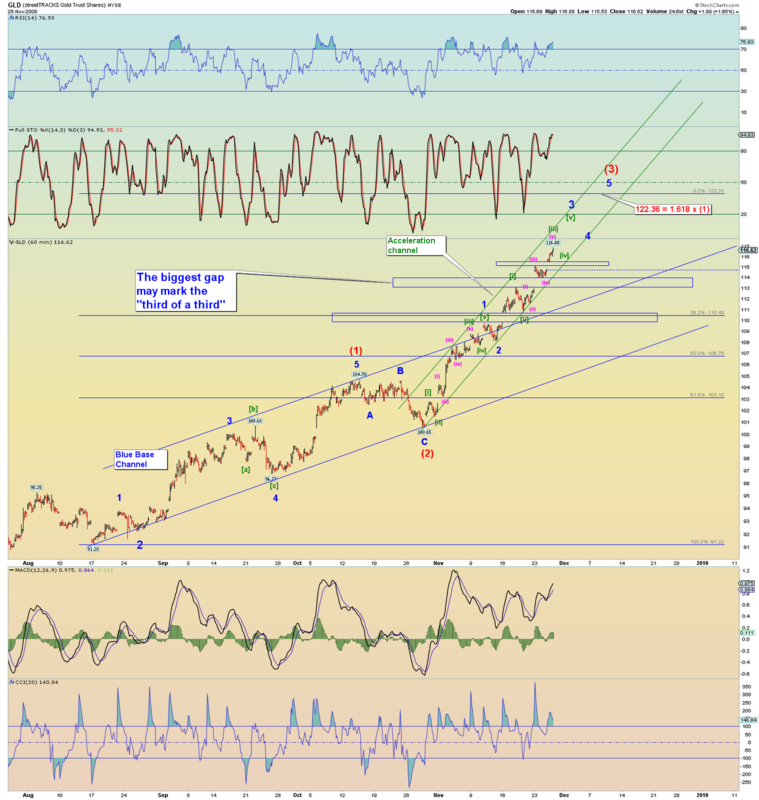 The middle "third of a third", if its correct, shouldn't get filled until this move is completely over and GOLD is retracing. Anyways its a crack at a count on GLD. Take it with a grain of salt. 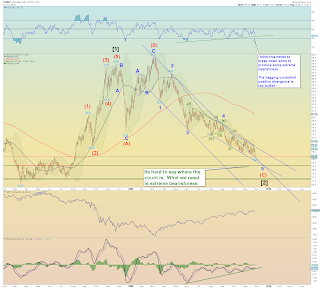 However if $1290 - 1300 for spot gold target is going to be hit, then I would guess this count is a pretty good one. That would be another 10% rise and another equivalent 10% rise in GLD would be about $128 as you can see it would fit nicely the overall count structure. But that is really pushing things yes? So Like I said, its not crystal clear I am just counting what I see. 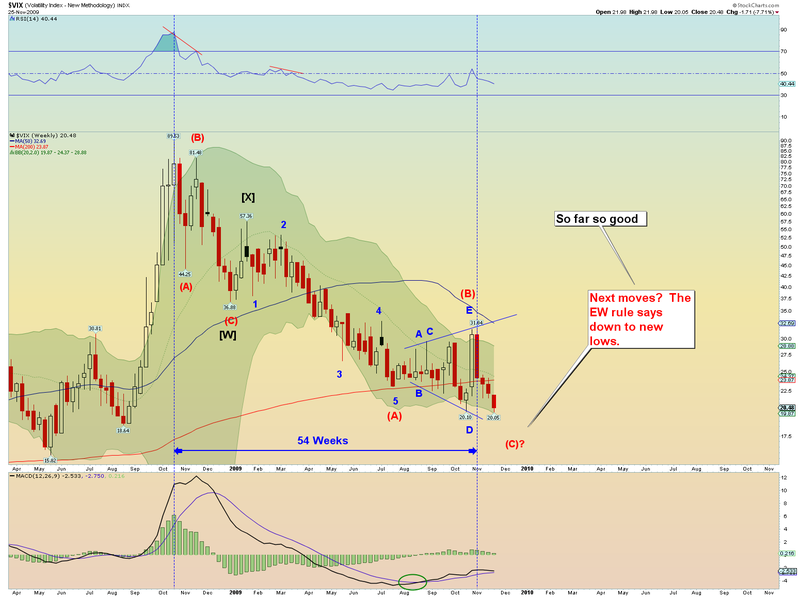 The VIX weekly's expanding triangle suggested new lows were coming. I think they can go lower sub 20. In fact I think a nice sub 20 reading would be great evidence that supreme complacency is back allowing a P3 to occur. 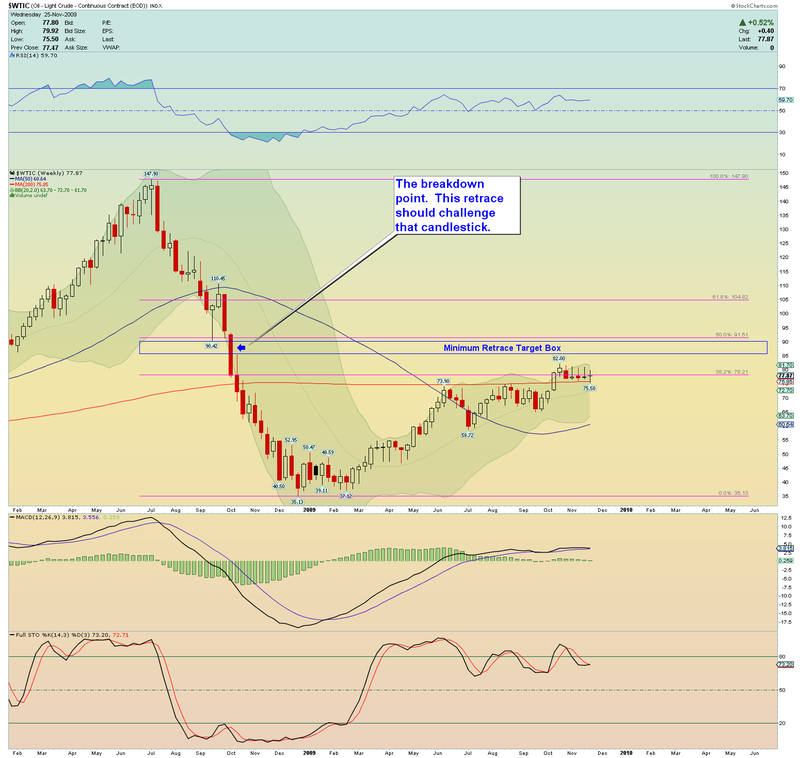 Oil has yet to retrace 50%. I think it challenges the blue box target area that is inherent in wave 2's. 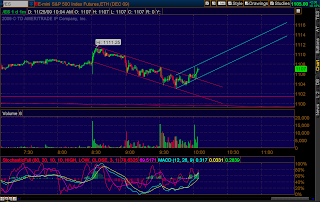 It seems to be consolidating anyways for a move higher. 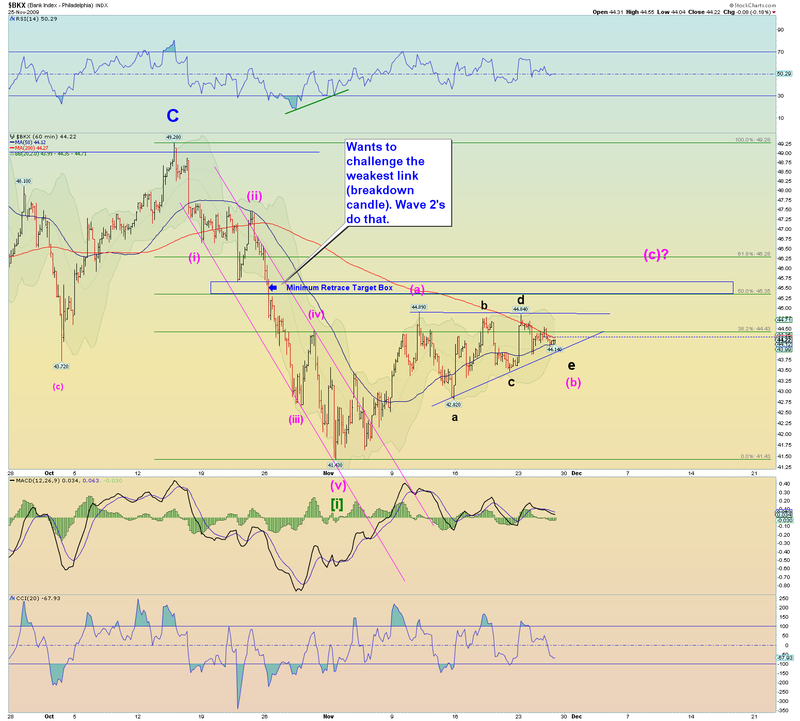 Again the blue box would be a proper wave 2 target area for the banks. It seems to be forming a triangle. And before you critique the triangle as being inferior for some minor reason, I will remind you that these are the kinds of triangles that usually work. 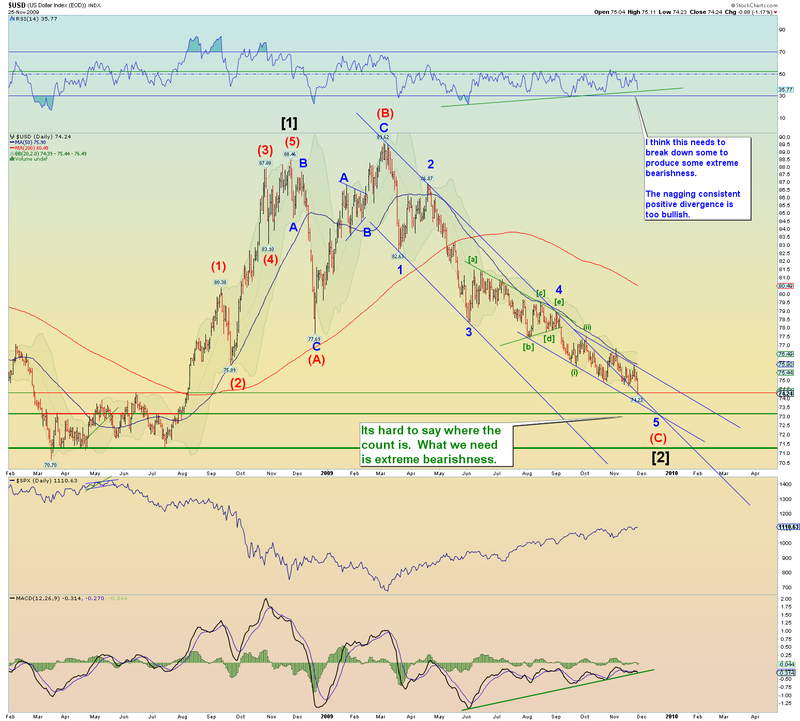 Gold is well on its way to my Inverse H&S target of almost $1300. I don't know if it will get there but man it could see some huge move days coming. 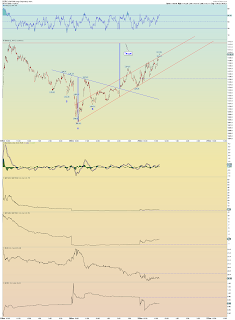 Its a steamroller but when it peaks get the heck out as its likely to do what OIL did - get absolutely crushed down. Bullish sentiment is almost at an all-time persistent record for Gold. 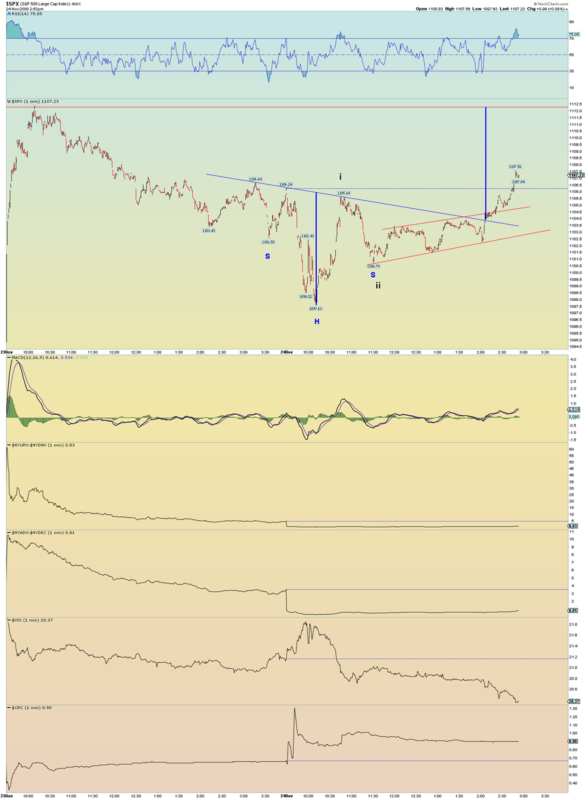 The dollar has this neat little positive divergence that is most bullish if you ask me. With all the dollar watchers its no wonder it just keeps trudging lower. I want mayhem and extreme bearishness! 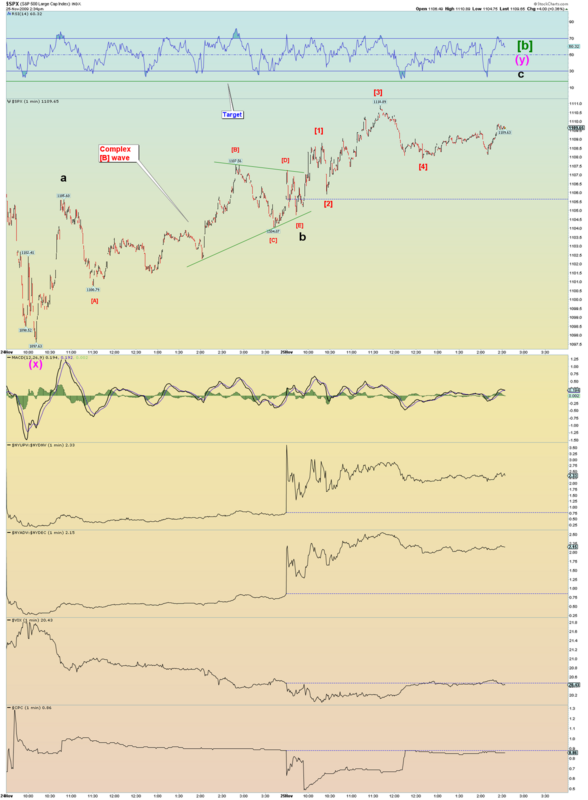 Break that RSI down a bit more and start panicking some dollar-watching bulls! 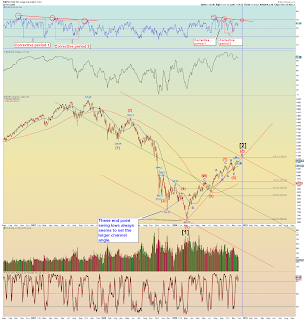 Jeepers, it could take out 2008's low for all I know this count is wrong. Key for this: I think we need extreme bearishness. 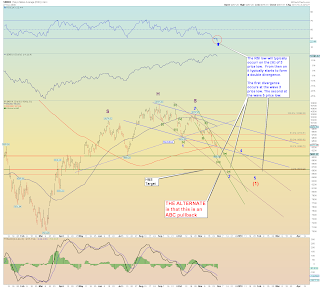 So all in all, for the most part, these charts support some further market(s) up moves. Doesn't have to be and I hate to keep pushing the envelope on these things but I am trying to assess things honestly. 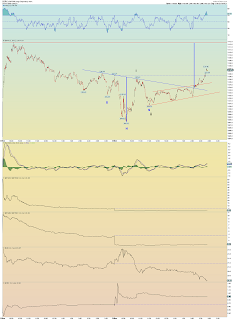 The reason I like to use e-minis is sometimes it helps in determining whats happening in the cash index. A reader Mark made a comment that he cannot see it selling off 2-3% because that would be hard to recover and why would it stop? And with market sentiment taking a strong turn toward bullishness this past week, I almost think that my [a][b][c] flat is a little too bearish at this stage of the game. I will say if a move back down to 1085 or so happens then the final move to P2 peak could indeed take us through the late December period. Ala "Christmas rally" or whatever. I haven't discounted this scenario. 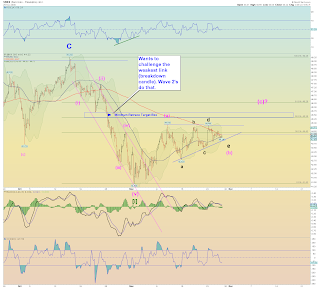 But I am considering the minor B of (Z) triangle scenario in that the [e] wave will come shortly and hold above the pivot point of 1097 where I have [c] marked. It would qualify as an ascending triangle and the target (using the width of the triangle) for that would be approximately 1137 SPX. Not that the target has to be hit exactly. If the market was to perform this move, bullish sentiment would be screaming even if it only makes it to 1129 or whatever. 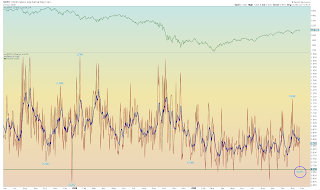 The VIX would easily drop to less than 20 and the dollar would probably be crushed which I expect because we need extreme bearishness in the dollar. 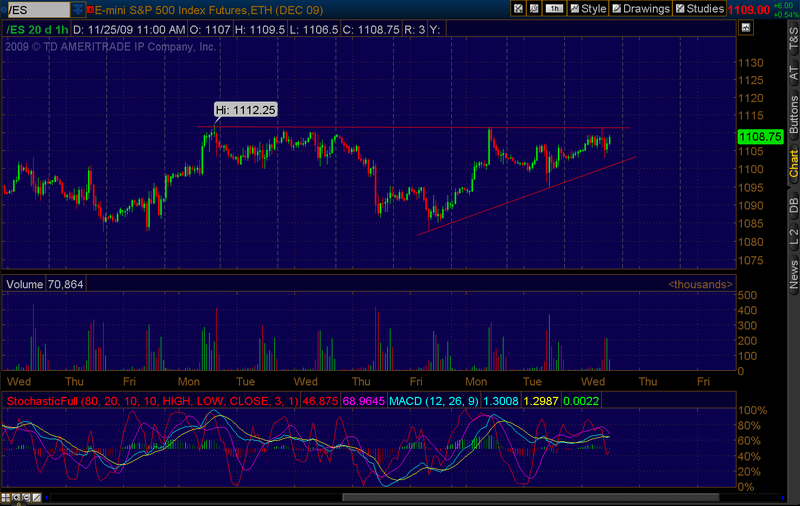 A break above 1110-1113 would be a break out move and who wouldn't think we weren't going to 1200 or at least 1158? 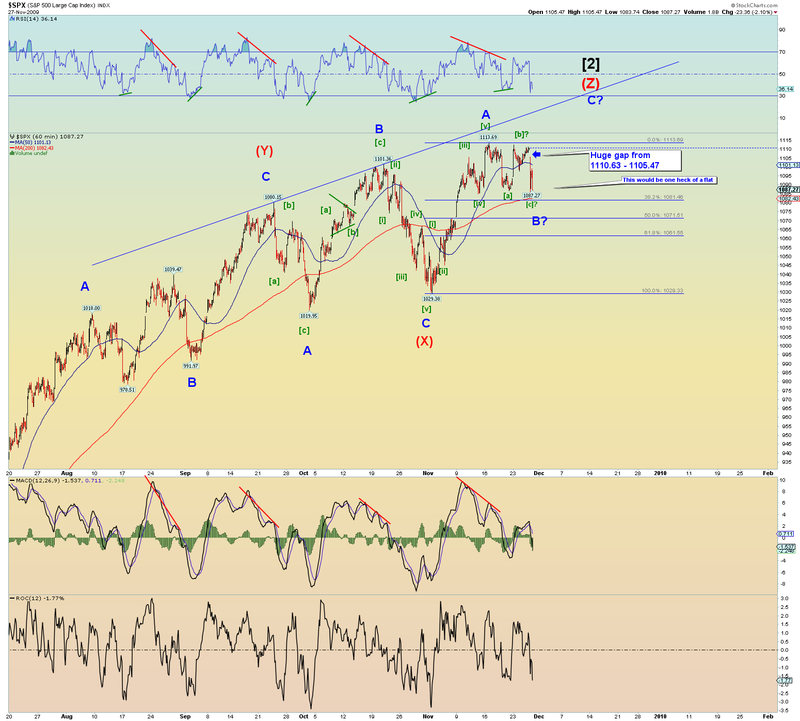 Blowing through 1121 also would be bullish. And this would happen within the next 2-3 weeks and there would actually be no Christmas rally to speak of at least not during Christmas itself. So when everyone is on "cruise control" til the end of the year, somebody may decide to pull the plug early and the autobot trading computers, who have taken over the markets, bearish algo's kick in and sell, sell sell. So my top 2 or 3 counts is either the [a][b][c] flat with a bearish [c] wave down to 1088 or so, or a triangle [e] wave that holds above 1097. There is not a whole lot of difference between the two I guess. Anything deeper than 1088 at this point is in danger of permanently staying underwater. 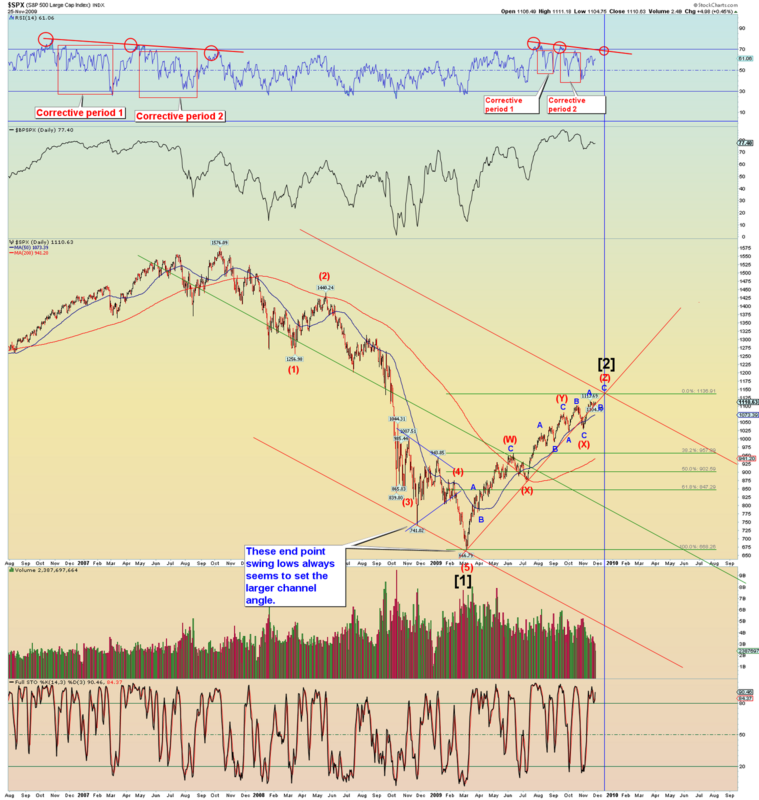 I would be willing to see a move to 1075 and see a slow recovery rally taking place for Minor C of (Z) but that scenario would likely take longer to recover and that would mean P2 would probably peak in January sometime. 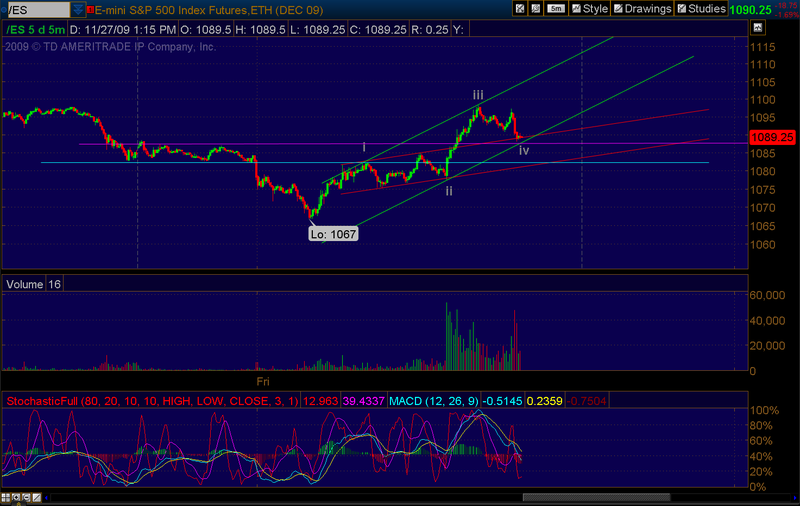 Option 1: The least retrace holds above 1097 in an [e] of and ascending triangle for Minor B. This gets P2 gets over with the quickest and sets a target of 1137 for Minor C of (Z). Bullishness peaks in euphoria. 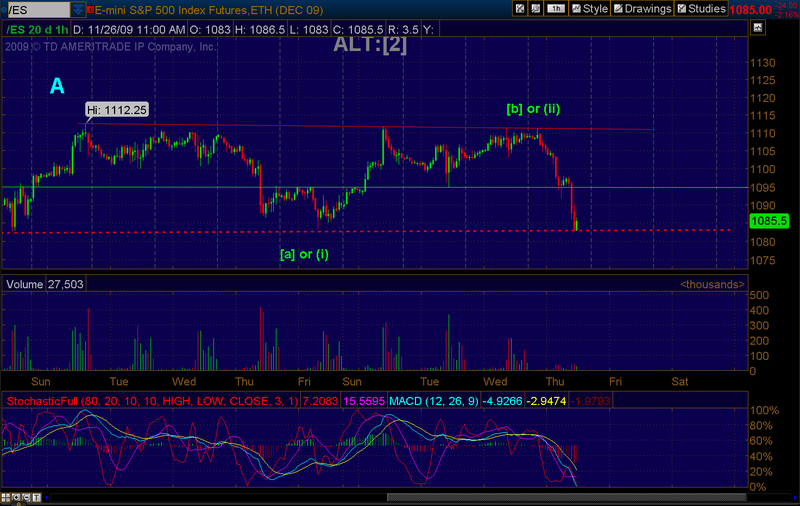 Option 2: A medium retrace to 1086-88 would be a [c] of a flat count for Minor B. The ensuing Minor C of (Z) P2 peak takes a bit longer to occur. Option 3: A deeper retrace down 1060-1075 in a [c] of Minor B would likely be an expanded flat for Minor B or downward flat. A recovery Minor C of (Z) to P2 peak would probably take longer and occur in early to mid January 2010. But everything is kind of pointing toward the shortest option(s) at the moment. Many possibilities going on. I am still looking for the completion of Minor B and I assume it has not yet finished. The best guess is a flat is playing out for Minor B or some kind of triangle that is yet unfinished. There are some good arguments that the market just keep going up from here in a quick burst peak that has everyone reaching for the moon and then the legs get cutout from under. And then of course everyone expecting a "cruise" to the finish line for 2009 may indeed allow stocks to drop quite far. Who knows. But you really cannot expect too much of a better setup. 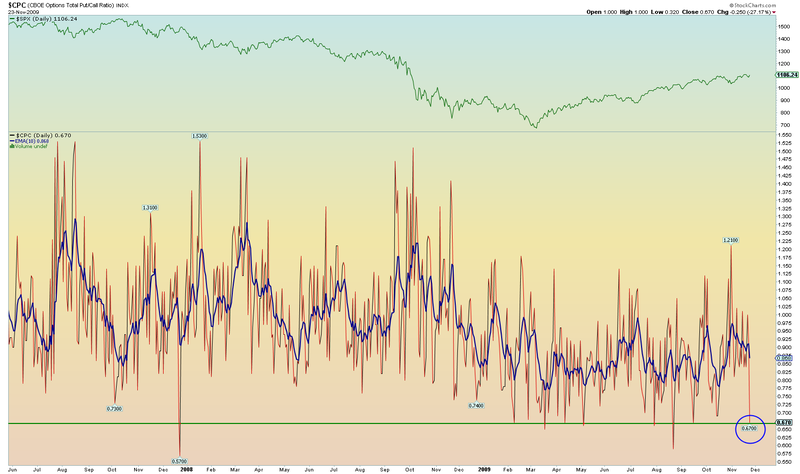 Sentiment is getting back to where one would expect at a peak. I don't have the info at my fingertips but this would be an argument for a quick peak instead of dragging out for a few more weeks. 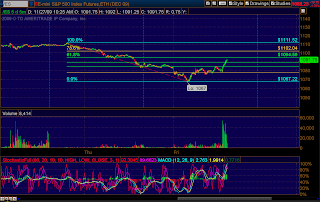 Lemme ask you this, who wouldn't short stocks at a higher level, say 1150 or 1200? So why would they comply with the move? Still struggling to make that 1112.25 target. Actually the whole e-minis looks ascending. I don't trust it though as I may have it labeled too early. But you gotta respect its potential. I assume the Wilshire5000 has been misprinting on Stockcharts. Can anyone confirm? I think the inverted head and shoulders target is still valid. 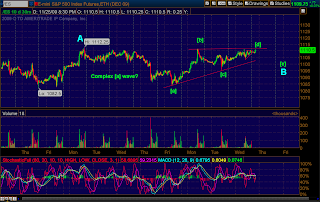 Very overlapping waves as of late which infers triangle waves for me, or corrective. 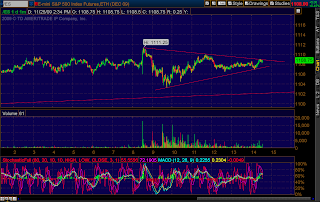 Its all starting to look and feel like giant triangle waves. Everything has that "three" look about it even in the sub squiggles. This would be consistent with a Minor B of (Z) of . 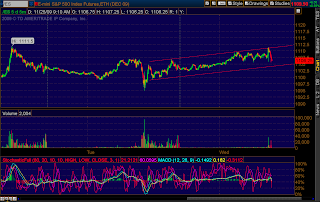 So a long sideways consolidation around the 1100 level. It could wind up being a double three of some sort also developing. Support at 1086-1088 and resistance at 1110-1113. 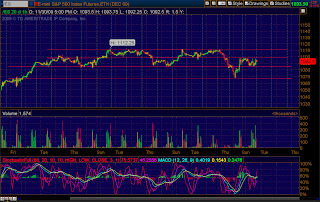 A trading range for now and I am not sure the low volume holiday market this week can break either range up or down. However I do expect some action on Monday the 30th and again on the 1st of December. A neckline breakout. No sellers this week as its holiday time. Sideways trending may be the name of the game. ..and of course challenging the channel line. By the way ignore the count, its not my primary count but I left it up from last night just to show you the extreme bear option. Sneaky bulls. 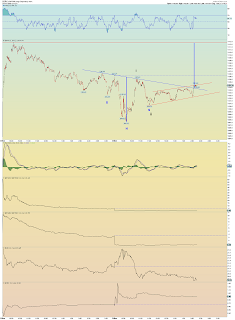 They attack the Inverse H & S formation from a side angle so as to lull you to sleep. And they do it in a stealthy leading diagonal-type move. Tricksy. And this is the overall Wilshire 5000 stocks. The blue channel is interesting. 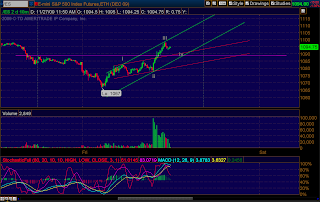 If its a wave iii coming down then it will try and make it to the lower blue channel line. 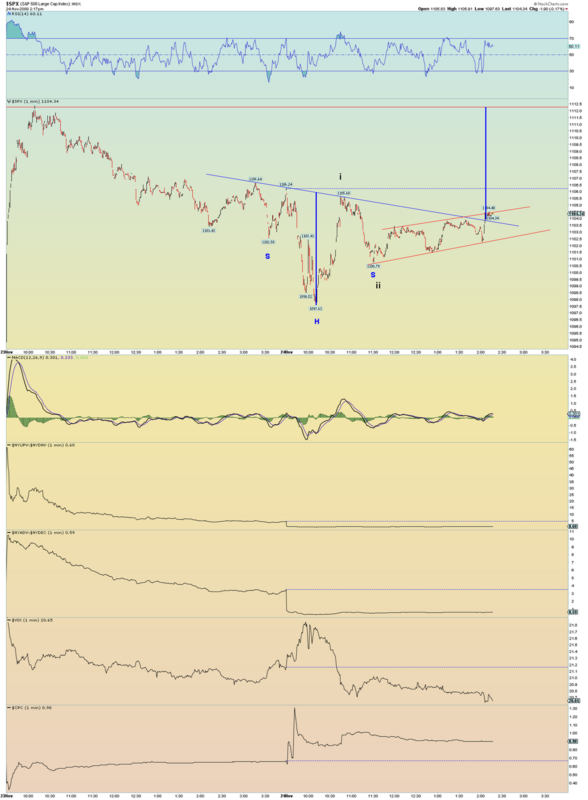 Bears have to watch out though for the stealth contracting triangle shown in dotted black lines. 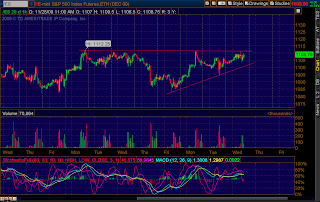 Its not a strong triangle formation but it would mean new highs for the Wilshire nonetheless. And stealth triangles usually work best too. 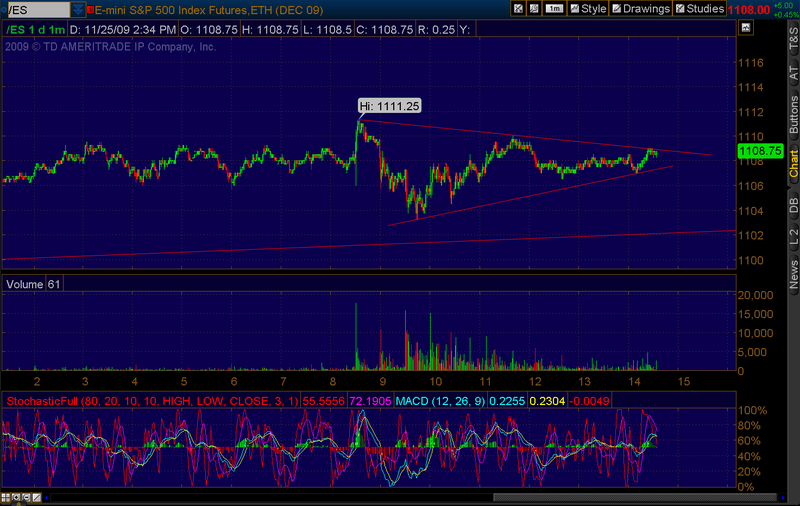 A break under 11180.37 eliminates the triangle. SPX trying to form an inverse H&S. 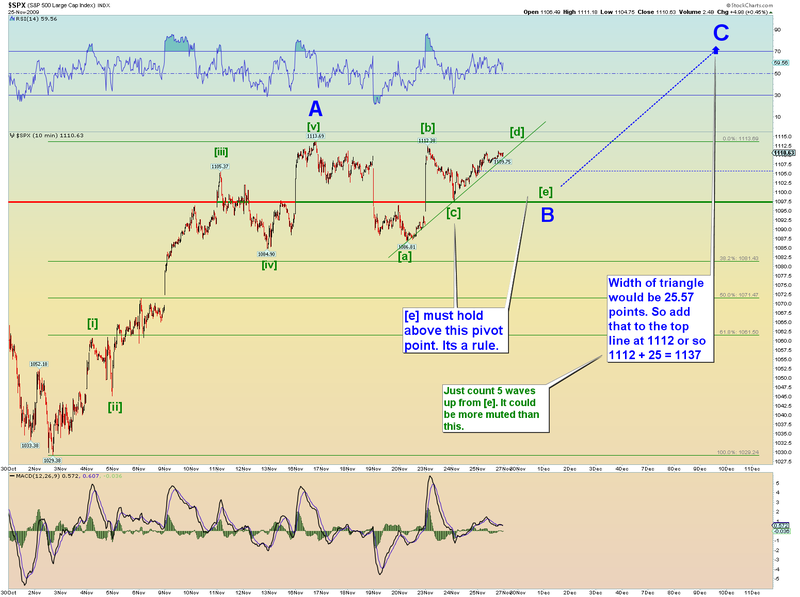 Target would take it close to its 1113 high. 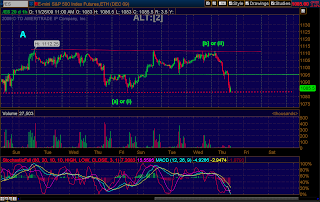 That big green bar has been retraced in full. 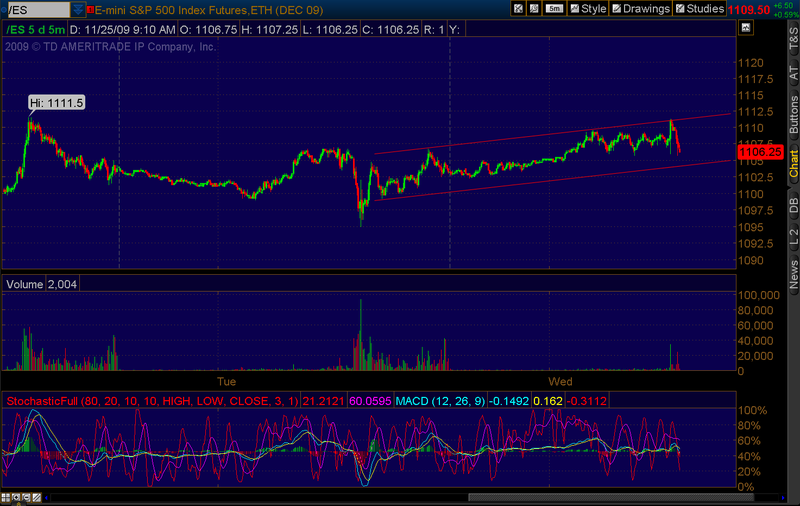 Curiously the price action seems to be forming and obeying a channel. 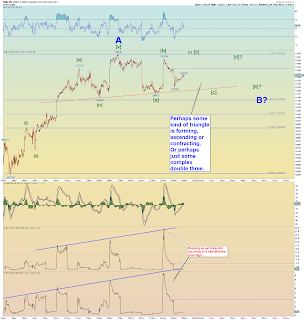 Also my research on "wave 2's" and that they often target the "point of recognition" (often a gap down). The market did just that today yet the SPX failed to squeak a new high. As many of you know by now, Robert Prechter of Elliott Wave International said he "seen enough" in today's market action to recommend to go 200% short. Now mind you he reminded his readers that there is of course risk involved in doing so. To be clear, I am not making any investment recommendation as I am just reporting what Prechter said. Because after all, I really don't run a trading sight here per se. I am just a blog stating a daily opinion and posting pretty charts. Due diligence on each's part is required. Say what you will about Prechter, a 200% leveraged short position by a man who once won a big time trading competition is not to be ignored. I merely want to entertain what the chart would count like if the market has indeed topped. Thats the real purpose of this post. 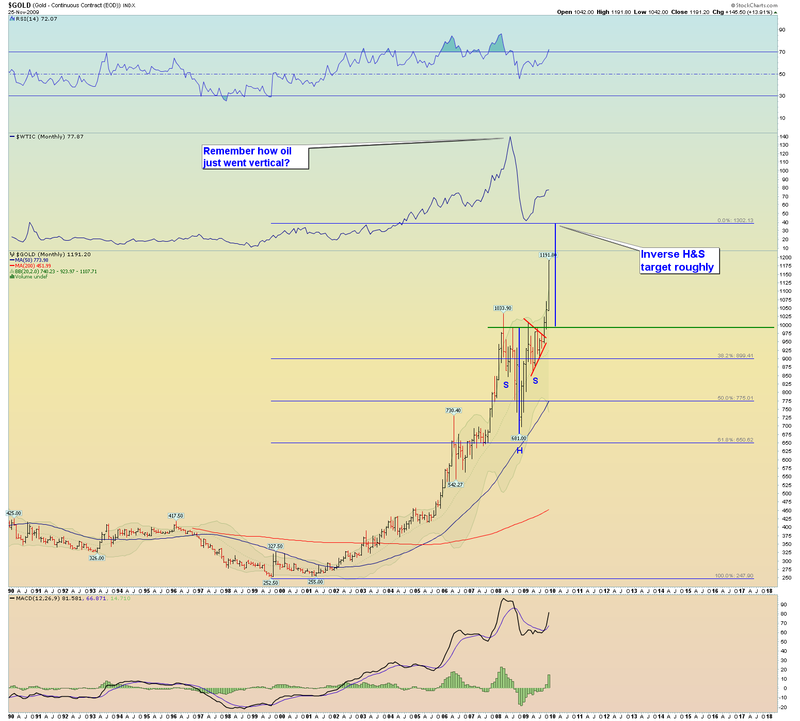 The attached chart presumes P2 has topped. 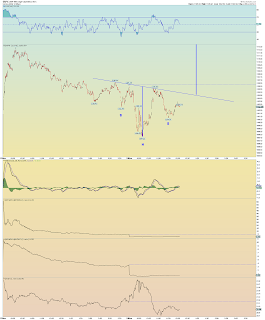 But, I do however favor more coming market weakness, perhaps severe, coming in my Minor B of (Z) count. So basically I am looking for a [c] of B of (Z) down to lower than 1087 and likely a good bit lower actually to major support at 1075 or 1065ish to fill the open gap. Perhaps its already started. My daily update charts tonight show my count. 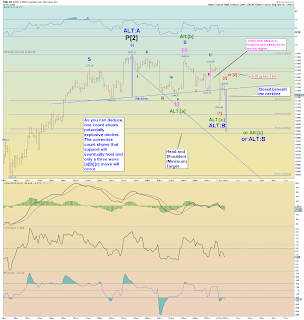 But again, price action is very curious and the CPC reached a very low extreme today. So in that respect, evidence of the sentiment extremes I mentioned are perhaps in the process of occurring and I seriously consider the P3 in progress count. I don't have access to up-to-date key market survey sentiment data so for all I know that has turned sufficiently bullish also. There will be more dots to connect tomorrow.